Welcome to Spring in London! It's been a cool but beautiful start to the season and there are definitley brighter days on the horizon. 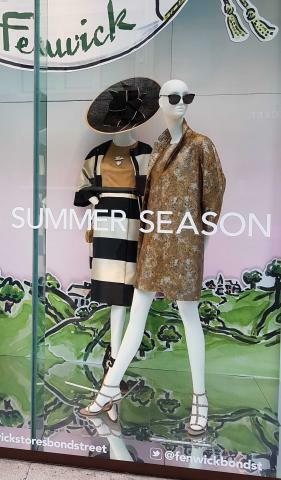 I have a great selection of events and fashion news to tell you about with some exciting plans for early Summer on the Horizon. I hope you enjoy and always happy to hear your thoguhts. 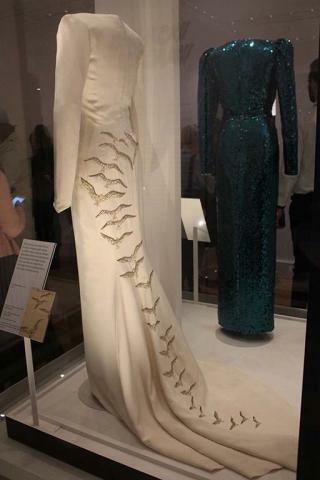 Just as London Fashion Week closed an exhibition launched to chart the Fashion history of Diana, Princess of Wales wardrobe at her home Kensington Palace. She was probably the foremost Ambassadress of British Fashion in the late 20th century and entering the year marking 20 years since her passing seems like a good amount of time to look at her style once again in the context of modern fashion history. Although her celebrity has endured as has the legacy of her work that is still being continued what is most intersting to me when looking at her clothes themselves is that while many of the styles and designs are 'of there time'; a great number of the looks could be worn today. I was delighted to see the Historic Royal Palaces Press team again and wrote a separate feature on the exhibition for a UK newspaper. It felt fitting that straight after London Fashion Week the celebration of this lady's wardrobe should open as she's still such a great influence on women's fashion now. Her style of simple occassion wear hasn't really left us in the last 20 years. Words like 'classic' can be over used in fashion but in her case, her outfits truly where. 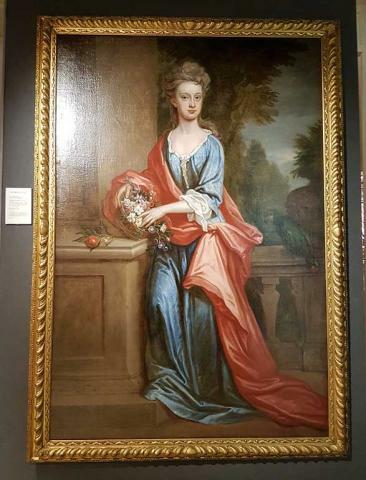 En route to Kensington Palace's re-freshed visitor rooms staffed by a super-friendly team, there was time to reflect on how this lady is becoming as much of the fabric of the legend of the Palace as any of the other inhabitants. Her core duties to family and charitable causes where also backed up by a life in the fashion world and having met people who worked with her in this sphere of her life from time to time, it's aparent how much of a positive impact she quietly made upon people of all different professions. 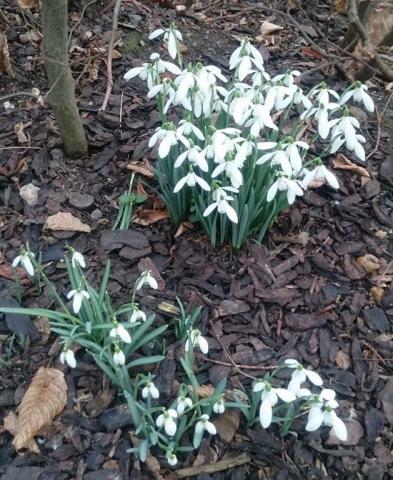 The snow drops where out for early spring in the Palace Gardens, a sign of a new season ahead of visting Historic Royal Palaces' first exhibition based around Diana herself. 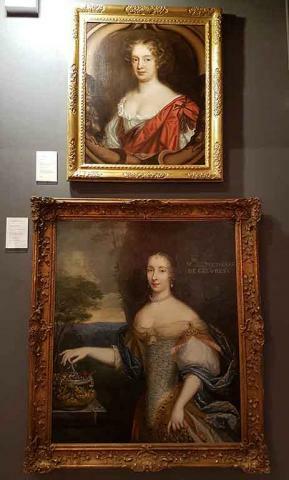 Previously some of her clothes had featured with other senior women from the Royal family but as this exhibition showed there is plenty of material and interest in the legacy of her role in fashion to justify carrying an exhibition herself. 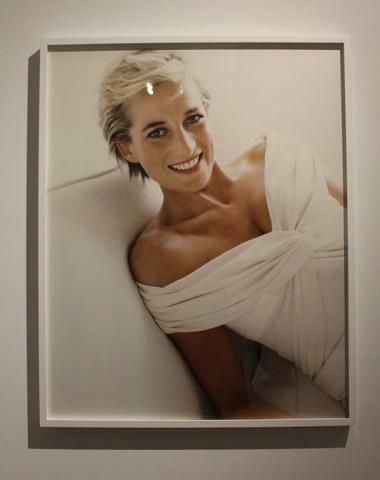 There are many iconic images of Diana that have been included included the Mario Testino series of portraits that adorn the walls in part of the exhibition space. 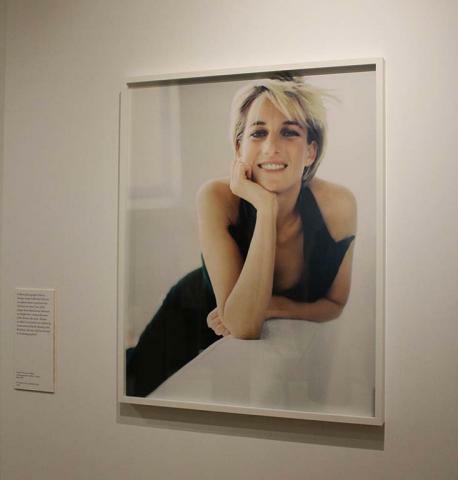 Here in a shoot that was to mark a new chapter for her in 1997, she looks relaxed in front of the camera and wears a couple of outfits that are shown in the exhibition. This is now a look back at Diana as one of the most photographed women of the late 20th century and her role in fashion history. 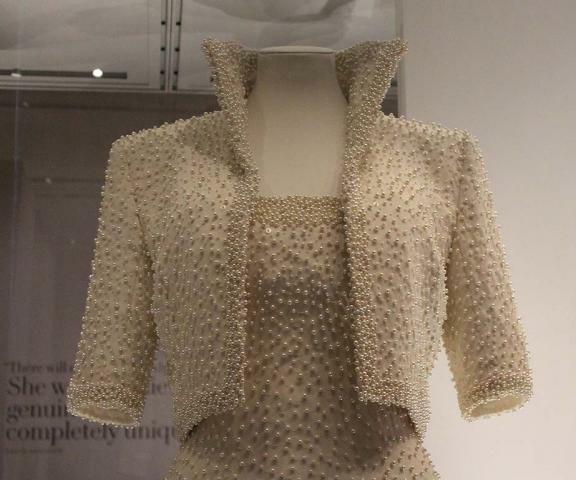 It's a measured and positive exhibition that rightly puts the focus on her work just as she hoped for and how fashion, often British designed was her diplomatic chanel of communication. 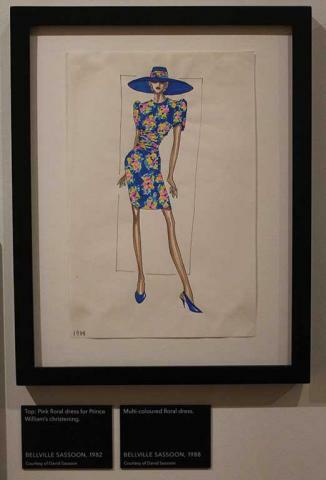 Long before the image of Diana in the wearing the dress was seen the consultation process would begin with designers meeting her, sometimes at her home with a cup of tea or their studio to look at sketches and talk about how an outfit could potentially work. This is a stage where you feel the sense of collaboration between designer and client. 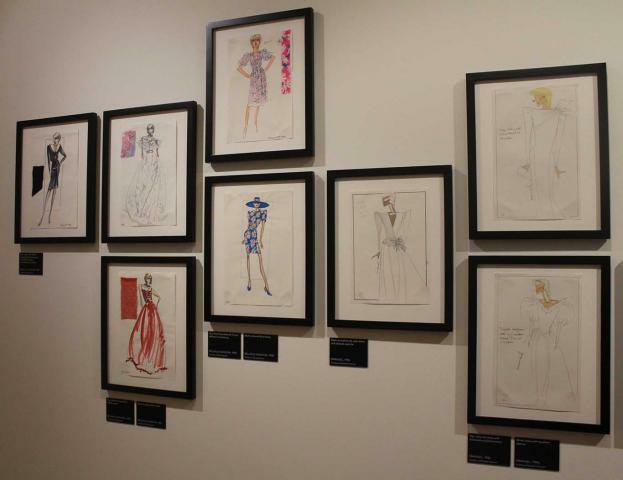 Diana liked to spend time discussing styles in detail and played a strong part in the design process, ensuring that outfits carried a meaning where possible for the events that they where worn at. It was an important part of the job for her, understanding the 'language' of fashion to communicate feelings or the message around particular events and themes that clothes can silently convey by a term I first started using a few years ago, Diplomatic Dressing. I personally love gouache water colour drawings like this and find them one of the most interesting parts of the design process. In their own right they can become collectors items and a unique record of fashion history. If I digress and talk about myself for a minute, looking at them I feel tempted to pick up the pens myself and start designing. 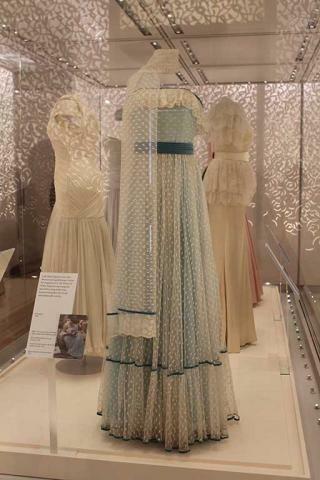 The look at the dresses begins rather fittingly with a light blue sheer nylon dress by Regamus that has been labelled as the 'Deb' dress by the exhibition although Diana was never strictly a deb' herself. Moods where changing in the late 1970's and many young women from upper class families where getting jobs and going to university as well as taking part in the summer social season. The word 'feminist' may be too strong but being 'brought out' into society when ones family was already well known was not high on many peoples list of priorities and making an independent step into the world seems to been a greater prize for the young Diana. She may have been bought her first flat at 18, but she was determined to work as where many of her contemporaries. 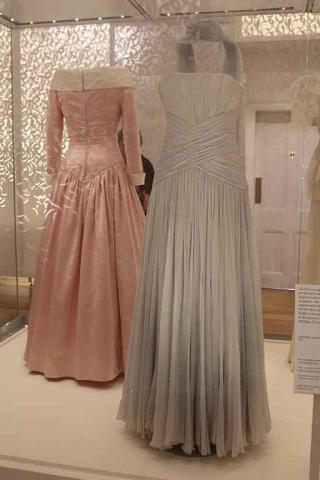 Regamus was very popular in the 1970's and early 1980's with women from aristocratic families and Diana chose this dress to wear at the ball that her father held for her at the Spencer country home at Althorp in 1979, an autumn ball rather than a 'deb' ball. With it's long lines and light feel it was easy to wear across an evening and suited her figure perfectly. 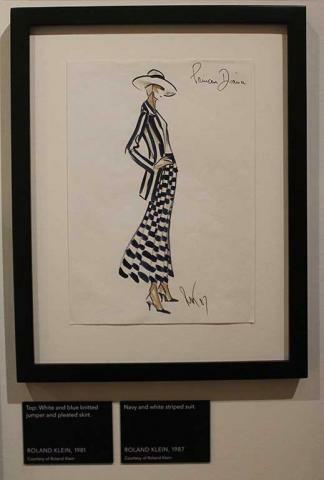 The light scarf adds an extra detail and the nod to definition of the high waist with a ribbon band heralds many of the shapes that she wore and styled with teams such as Catherine Walker and others in later years. It clearly worked for her. 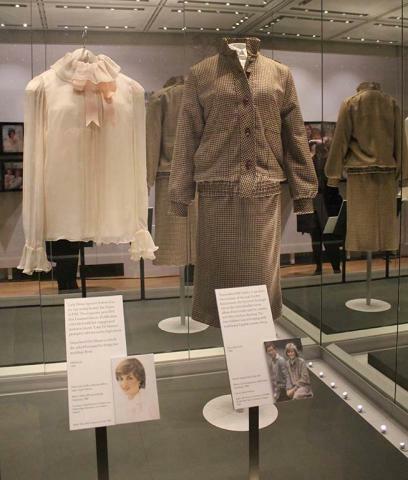 Above to the right the blouse designed by Elizabeth and David Emmanuel ahead of Diana's engagement to The Prince of Wales featured in a photograph published in Vogue magazine profiling the young Lady Diana Spencer as an 'up coming lady' taken by Anthony, Lord Snowden the former husband of Princess Margaret. I think this may have been a piece to introduce Diana to the wider public a little more ahead of an engagement as it would have been shot a month or two ahead of the February publication however as it sat on the news stands the engagement actually happened in a romantic twist of fate. This pale pink chiffon blouse with neck ribbon was a perfect light piece to add to the spring wardrobe and prompted a rush of sales of similar designs in the first rush of excitement around 'Di style'. This romantic look has come back again and I think it's a style that would sell today. 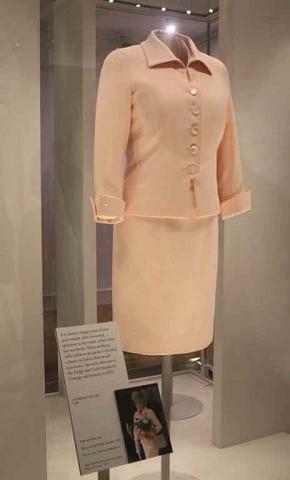 Further right is the brown wool tweed suit by Bill Pashy that Diana wore on her honeymoon in Balmoral. With an eye for practicality she asked for two sizes to be made and chose the larger that allowed for more room to move comfortably when taking part in country sports such as shooting and fishing. The tweed reflected smart British country style and was instantly recognisable to a world wide audience. It showed very clearly how seriously Diana took clothes in the sense of being fit for purpose and not simply to be showy or draw attention. 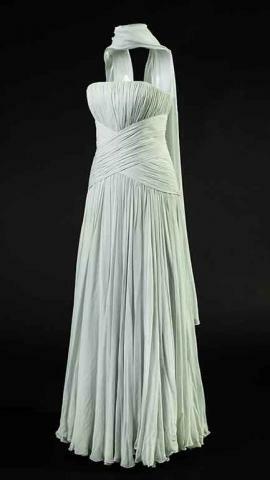 The blue silk chiffon evening gown and scarf above by Catherine Walker was worn by Diana to the Cannes film festival in 1987 and to a performance of Miss Saigon at the Theatre Royal in 1989. 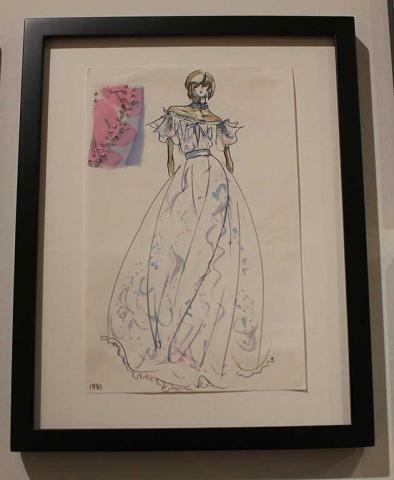 Diana loved the film and theatre and this piece was also a subtle homage to Grace Kelly who had married Prince Ranier of Monaco and moved her life from Hollywood to the French Riviera. Diana met Grace during her engagement at a reception at the Goldsmith's Hall and one of her first official duties as Princess of Wales a few months later sadly had been to represent the Queen at Princess Grace's funeral in Monaco. 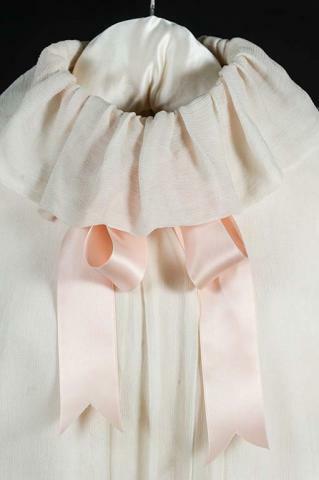 Shown next to it another look by Catherine Walker in pink satin with a raw silk collar was designed to be an equal to the military detail of the naval uniform worn by Prince Charles in an official portrait by Terence Donovan in 1987. 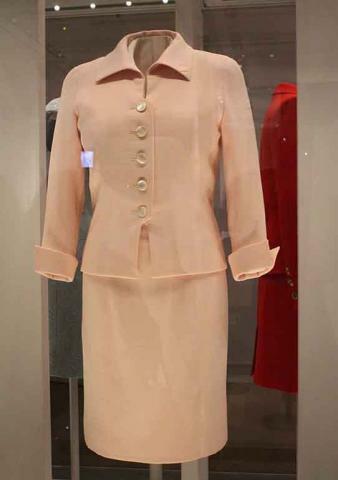 The emulation of double breasted style with buttons on either side of the bodice and echos the military jacket directly with the sugar pink of the dress reflecting 1980's conventions of gender image. With it's pin tucked fabric at the lower waist descending into a full skirt the echos of traditional women's dress from previous centuries may also have hit the right note for official visits to Germany. 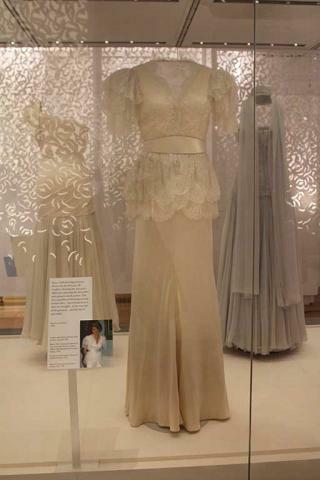 Center above the cream satin dress by Bruce Oldfield with it's lace over-bodice and satin belt was worn at the Coutauld Institute of art at Somerset House in 1990 and at a State Banquet at Buckingham Palace in 1991. 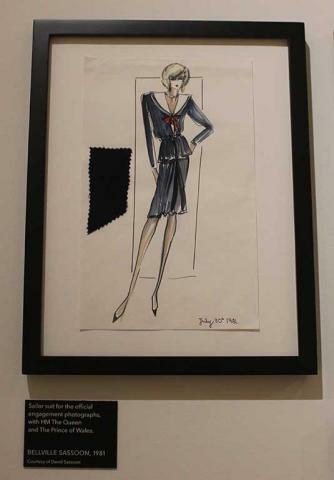 Bruce recalls Diana relying on her chosen designers to dress her appropriately in design and fitting for the occasions that she required clothes for. She wasn't a diva looking to make a grand entrance at parties. 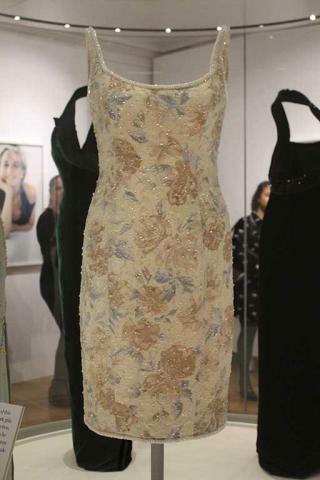 Gina Fratini designed this beautiful classic silk chiffon gown trimmed with sequins and beads above to the left for an official visit to Brazil in April 1991. She wore this sari-inspired piece to a ballet performance during the visit and a couple of days later she made headlines around the world by shaking the hand of a patient with AIDS for the first time after deliberately removing her glove first. At a time when there was much speculation about what AIDS was but little good information feeding through to the public as a whole this was an important gesture. Diana knew the power her image had to do good work and capture attention for the right reasons. The one shoulder a-symmetrical style was one that Diana favoured through the 1980's and 1990's. Catherine Walker is one of the designers that Diana came to rely on most heavily and it was with her that in later years she came to perfect her style through. 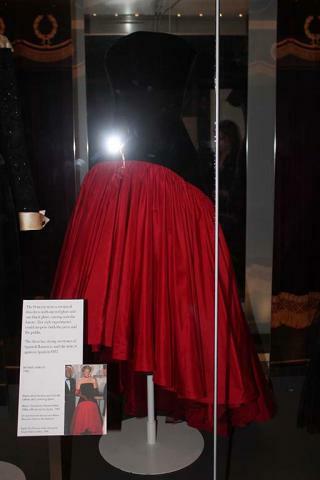 To the right above on the most famous gowns that she created for Diana that became known as the 'Elvis dress'. Walker dress inspiration for the collar from the Elizabethan ruff and the white silk crepe dress and jacket where embroidered with thousands of sequins and pearls. 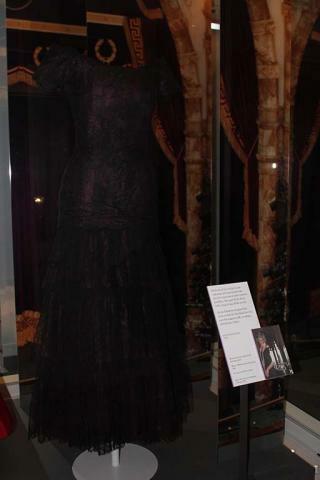 Walker later said that Diana 'shone in that dress and the dress shone around her'. With the iridescence of so many pearls it's hardly surprising. 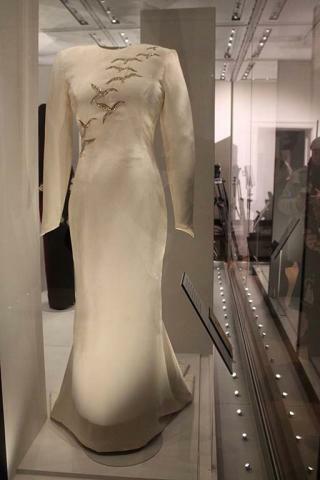 First worn on an official visit to Hong Kong in 1989 the dress was worn later that year by Diana when she presented the Fashion Designer of the Year Award at The British Fashion Awards. Although Walker was not nominated, Diana later told her that she felt that the award belonged to her. Diana's presence at the Awards that evening would perhaps have given that impression to many. 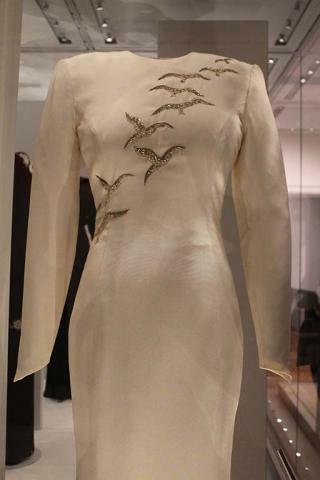 Choosing a look that will have a resonance with the audience was very important for the Princess and for a state visit to the Kingdom of Saudi Arabia she commissioned this lesser known dress from Catherine Walker in cream silk crepe with sequins shaped in the form of falcons, Saudi Arabia's national bird. The high neckline and long sleeves carefully respected the tradition and customs of the country and the piece contains a beautiful folded train in the skirt. The sequined 'mermaid' dress to the right comes from what the press dubbed Diana's 'Dynasty' phase where she lead international trends for shine, sequins and shoulder pads. First worn on an official visit to Austria in 1986 it shimmered in the spotlight under the camera lights and was worn again at further charity balls in 1989 and 1990. Earlier on in her career in the public eye Diana liked to follow trends a little more than dictate them which is hardly surprising when you think that experience gives that confidence and wisdom. 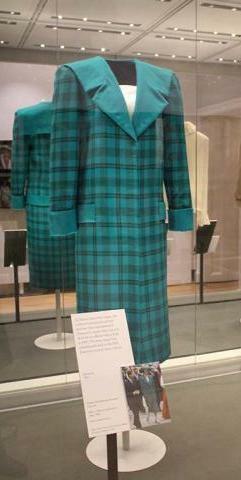 Above to the left the green wool tartan day suit from Emmanuel was worn on a trip to Venice, Italy in 1985. The square shape was very fashionable at the time but the press where however critical and this outfit was spotted in a charity shop near to the Sandringham Estate before being sold at auction many years later. 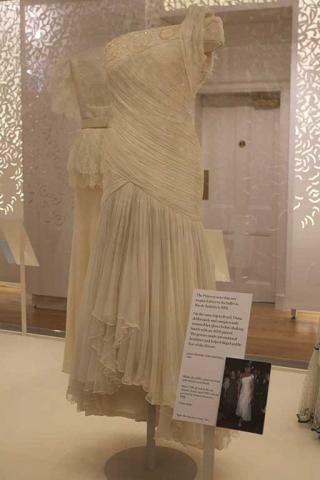 Placed in a cabinet along side the Emmanuel blouse and tweed suit worn at Balmoral it was a grouped with pieces from early in Diana's public life. Above are some stills from the collection behind the scenes. 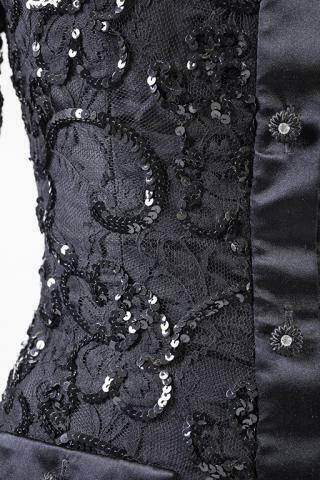 Against the black, the detail of the dresses stands out very clearly. 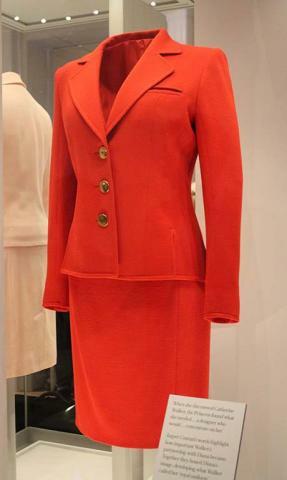 To the right a classic red day suit designed by Catherine Walker from 1996. Diana re-wrote the rules in terms of Royal dressing and believed that it was important to meet hospital patients and children without wearing gloves so that skin contact would show a human and caring rapport and also, especially when visiting patients with AIDS that there was no reason why you couldn't have skin contact or give a hug. Diana also dispensed with hats for hospital visits especially as she felt that for children it was off putting and made a person seem remote. This suit was worn for a public engagement for a launch of a children's HIV/AIDS charity London Lighthouse appeal. It's bold red colour signalling warmth and symbolism. Colour was for Diana and is for Royal women today a key language of communication. 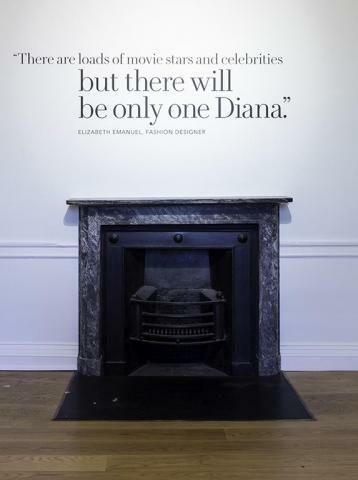 When Diana worked with designers she often relied on them heavily and with the pressures of running their own businesses it sometimes was an honour that could prove to be a little overwhelming. 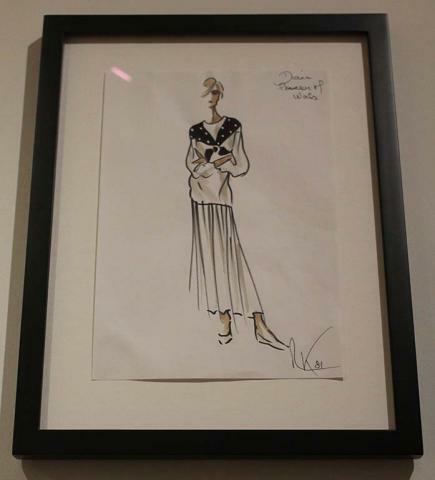 Jasper Conran worked closely with the princess for many years and noted that in Catherine Walker Diana found what she needed, a designer that she could rely on to concentrate on her almost as her on-call personal couturier although she continued to patronise other designers as well. Together Diana and Catherine Walker worked together to develop what Walker called Diana's working wardrobe, a simplified look that she adapted for both on-duty and off duty times. 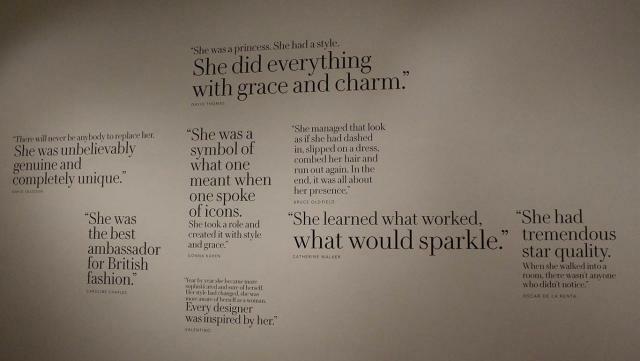 The quotes to the left illustrate how many designers thought highly of her, admittedly she had a very prominent position as the world's most photographed women but all respected her own sense of style and position that she developed within the fashion world. Also the Head of Christian Dior's Haute Couture Maison in Paris who visited her to perform fittings remembers Diana as a very charming person. 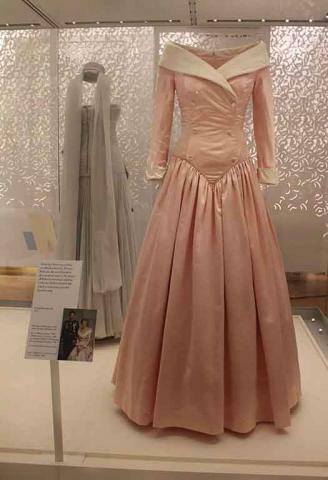 This pale pin day suit was worn by Diana to a charity engagement in London at the Savoy in 1997. Her priority for composition of outfits when she undertook charity work was for simple looks that would not detract attention from the charitable causes that she was supporting. 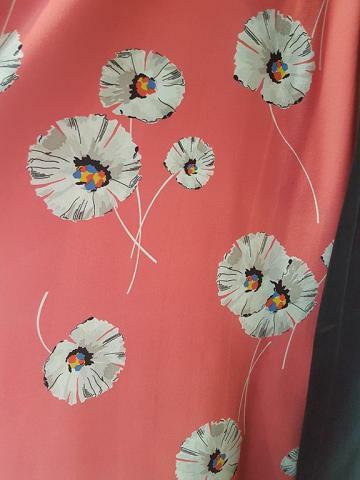 She would wear cheerful colours that children would like in fabrics that would not crease or crumple. 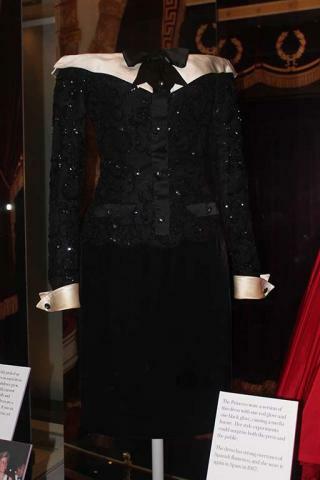 This suit was worn for to attend the Daily Star Gold Awards for Courage and Bravery where she met young children who had shown many amazing qualities of strength. 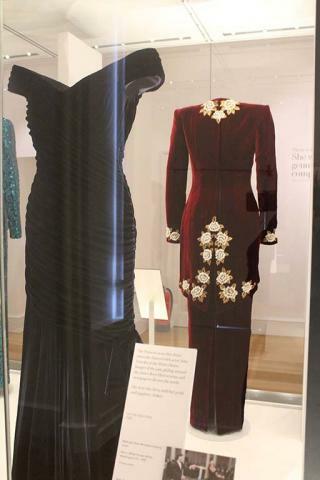 To the right the burgundy silk velvet evening dress and tail coat was worn to a premiere in Leicester Square of Steel Magnolia's in 1990 and later in 1992 on a trip to South Korea. You can see the embroidery detail front and back emphasising the craftsmanship of Walker's atelier. 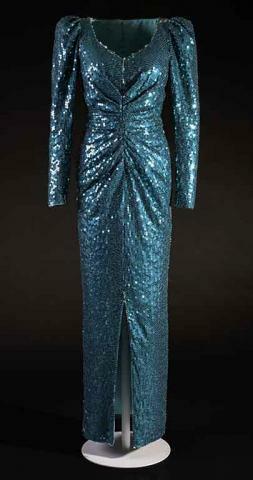 To the right also the famous, and my favourite, midnight blue 'Travolta dress' by Victor Edelstein. 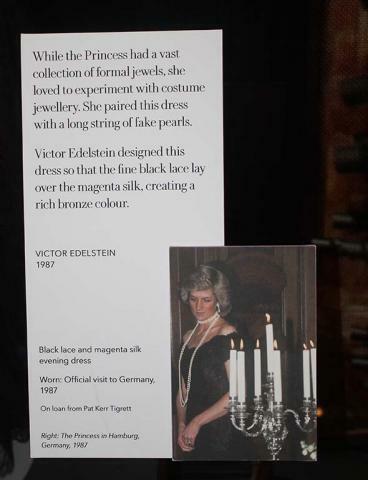 Edelstein was one of the lading British couturiers in the 1980's and 1990's and the princess frequently attended his shows for a private run-through before the collections where unveiled. 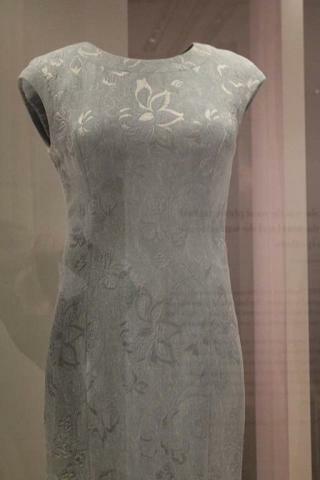 This dress in blue silk velvet was bought by the princess because she loved it instantly but Edelstein had no idea that it would later be worn on the state visit to America in Washington D.C. at the White House. The images of Diana dancing with John Travolta where beamed around the world and passed into fashion and popular history. 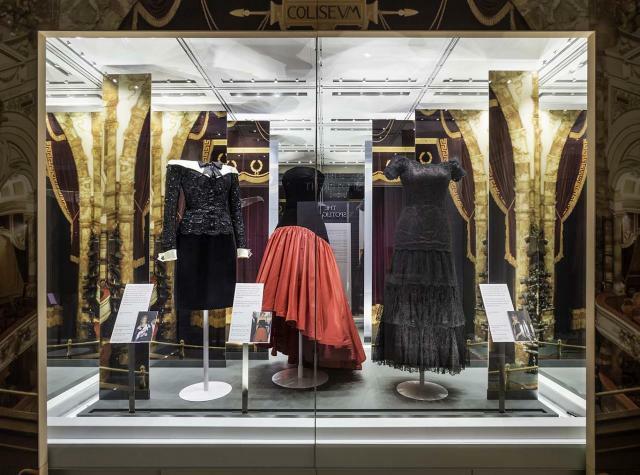 Theatre, Cinema and visual entertainment was a great love of Diana's and when her duties involved visits to the London's West End to see the shows open she put a lot of thought into creating something memorable that would also mark the occasion. Below you can see one of the cabinet's that aptly celebrates this love of theatre. 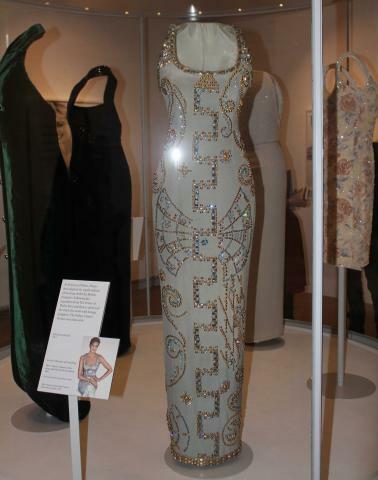 To the left and in close-up to the far right the 'tuxedo dress' by Belville Sasoon was worn to a concert at the Barbican in 1989 by the princess. 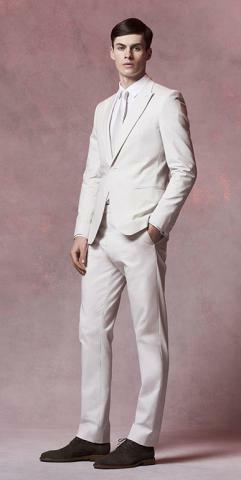 It was a humorous play on the male version of formal wear with white cuffs and collar and she looked stunning. To traditional eyes it may have raised eyebrows but the look was very popular. 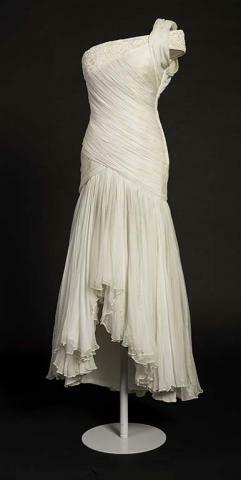 The black and white silk satin cocktail dress with glass beading was an example of Diana, still in her 20's starting to break the rules that she had already learned backwards. This was an unusual choice for a Princess but nevertheless it worked. 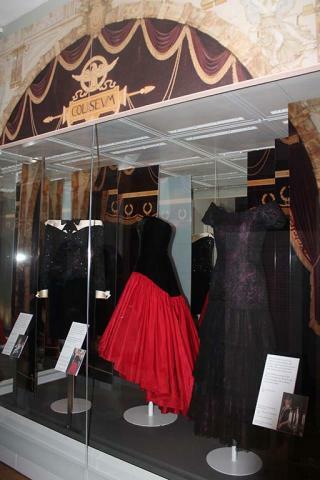 Center in the cabinet the dress by Murray Arbefield worn by the Princess in 1986 to the America's Cup Ball at Grosvenor House in London and later on an official trip to Spain in 1987 with it's black velvet bodice and red taffeta skirt is pure 1980's glamour. Showing her daring side, she wore it with one red and one black long glove. In Spain the nods to Spanish flamenco style won hearts. 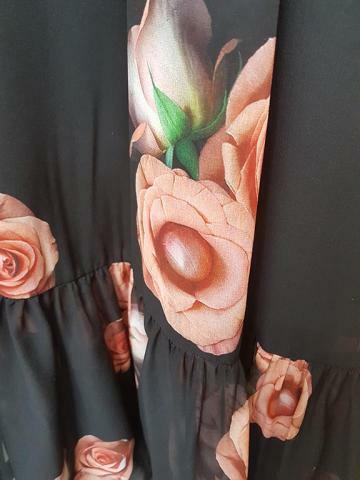 Below is another dress designed by Eldestein that is stunning in it's detail, see inset places next to it for a close up of the applique on the bodice. 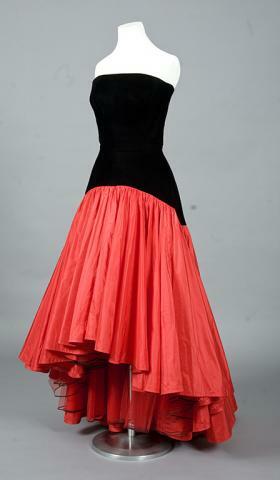 This dress composed of black silk with a magenta underlay created a slightly bronze effect when worn and appeared on the Princess during an official visit to Germany in 1987. It also serves to illustrate Diana's use of costume jewellery. She had access to a large collection of jewels through the Royal Family and her own, but she found experimenting with costume jewellery ideal for giving an outfit an extra stylistic touch and importantly for a person who travelled a lot there was never a serious concern if pieces where lost while abroad if they where not of high value. It's a gentle reminder of how much fun it can be to experiment with fashion. A life in the public eye can bring many opportunities and also the potential to do good work to help others and highlight the work of others. As the foremost ambassador of British women's fashion in her generation Diana undoubtedly did tremendous work to raise the profile of British fashion and in that also high fashion and something we are today still not producing enough of, British Haute Couture. We all love jeans and sweaters as much as Diana did herself but the high end of British fashion has been lacking a champion who stood out from the crowd until Catherine, Duchess of Cambridge began to wear British fashion in her role after her marriage. 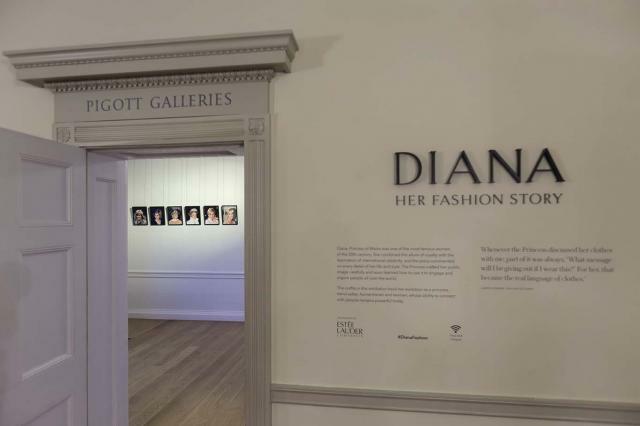 This exhibition is however about Diana herself and her life beyond the royal family, her journey of personal discovery expressed through clothes. 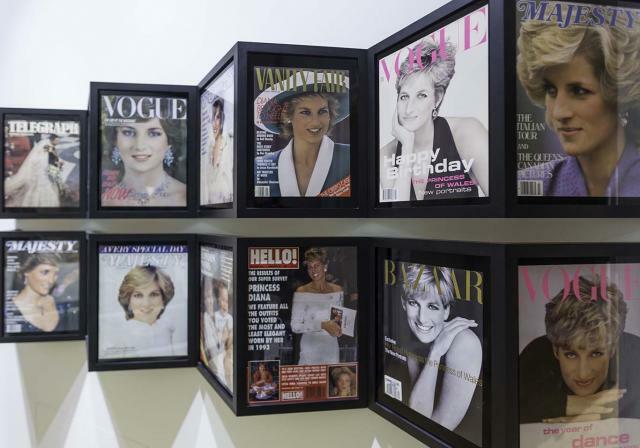 The many magazine covers serve to illustrate the unique level of attention that Diana drew and the global fascination people had with her. In short a person who looked like they could be a high society super model had never married into the British Royal family, probably the most well known in the world and the combination of these two things took everyone by surprise in the effect that it had. Her transition to life as a high profile but independent woman allowed her greater freedom to embrace many new things and that included being able to wear more international designers such as Versace. 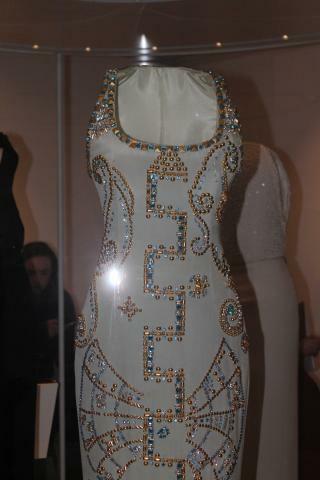 The famous Ice blue silk dress with intricate beading that gave a jewelled impression by Gianni Versace is one of the most captivating of the exhibition. The dress is now part of an historic cover for Harper's Bazaar shot by Patrick Demarchelier. 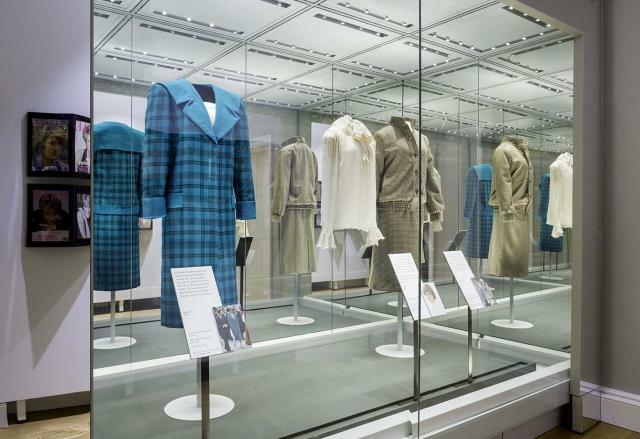 The final room of the exhibition shows dresses worn by Diana for official engagements and also showcases many from her time transitioning into life as a single woman. 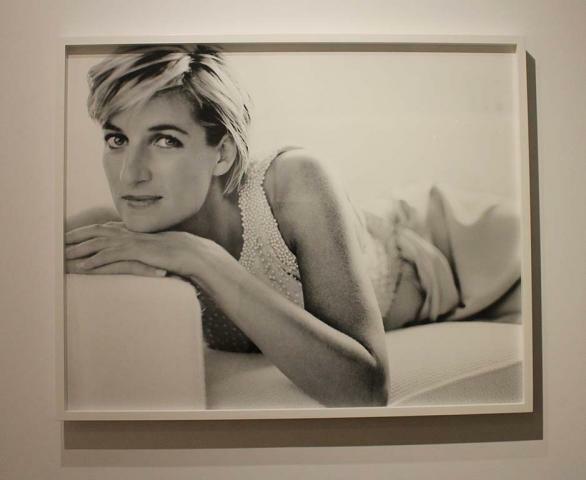 The portrait photographs on the back wall shot by Testino and Demarchelier serve to illustrate quite neatly how powerful portrait photography can be. The images reflect a sense of quiet ease and although undoubtedly high fashion in their composition carry a sense of intimacy and simple honesty reflected back from the subject as she looks at the camera. Two outfits from Catherine Walker neatly show the contrast of the journey that she had made over the previous 18 years from shy teenager to high profile independent figure. The blue shift dress to the right was one of the key pieces that Walker created as part of Diana's focus on defining a new identity. A simplified executive style. 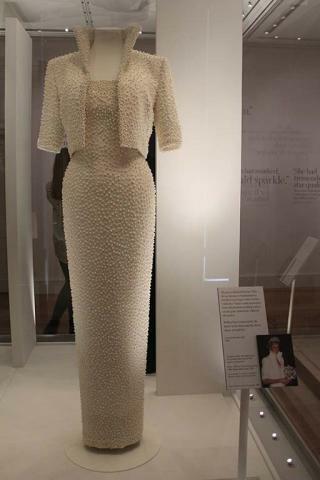 To the right below the sequined cream shift dress with it's rose detail was the last to be worn by Diana and was also the most symbolic. 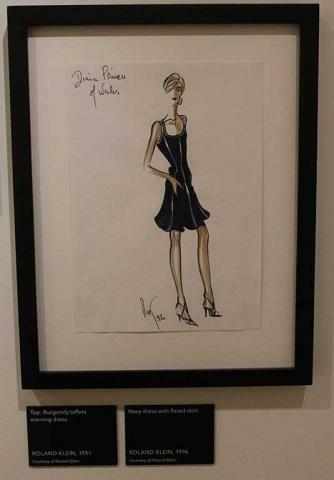 Created by Walker to be worn in New York at the dinner to celebrate the Christies sale of many of her dresses to benefit her charities this point in June 1997 marked something of a closing of a chapter for Diana as she planned to set about a new era of her life. Sadly we did not see what came next but have so much to thank this kind lady for in her legacy both to fashion, the fashion industry and the innumerable charities and people she worked to help. 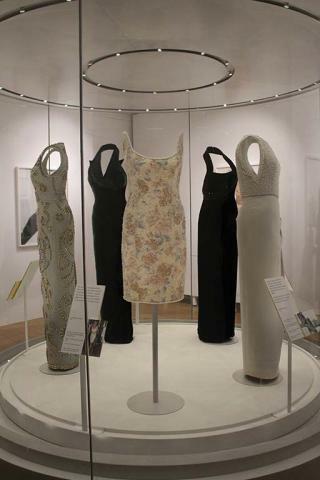 The exhibition is now open and anticipated to run for two years until early 2019 with dresses rotating in and out of the exhibition over time at the generous donation of public and private international collections. For more information and prices please look at the website of HRP.org.uk. With thanks to the lovely HRP team. Beulah London's Spring - Summer 2017 collection and visit to India. In London when your shopping for occasion wear or something special there is a myriad of choice and much of it excellent, but there is one luxury clothing brand that is one a mission to help to create an impact on the other side of the world enabling women to lead lives of Independence as a direct result of sales of their clothes internationally. Beulah London was founded by Natasha and Lavinia as a means to help fight human trafficking funded partly through the sale of their clothing. 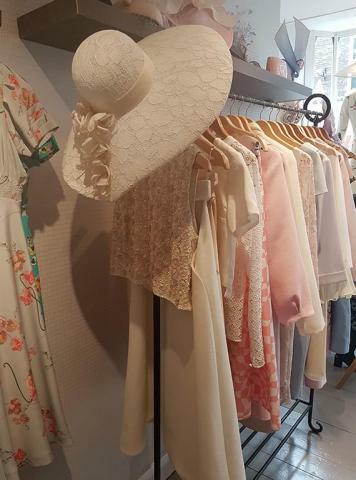 At first glance the glamorous outfits perfect for weddings, christenings, the Races and Polo days may seem a world away from the back streets of Kolkata in India but Beulah believe in the Butterfly effect and the connection that all people have in an unseen chain. So many clothes worn in the wealthier part of the globe have a traceable origin in a place where people live in harsh circumstances so why not acknowledge this and make it a route to effect a change in people's lives? It can be done and it's working. Since 2009 the Beulah Trust has been working with charities such as My Key to Freedom and Freeset to do just that. For Spring - Summer 2017 the new collection was shot by the very talented Katrina Lawson Johnson at Kew Botanical Gardens in West London with make-up by Charlotte Cowan. The collection looked to several inspirations including the colourful tiles seen in many parts of India including Jaipur and the inspirational watercolours of Monet. Mix in some British classics such as tweeds and English style embroidery and you have a collection made up of timeless pieces and fresh design. Something for everyone here and as usual friendly to buyers across the generations too. 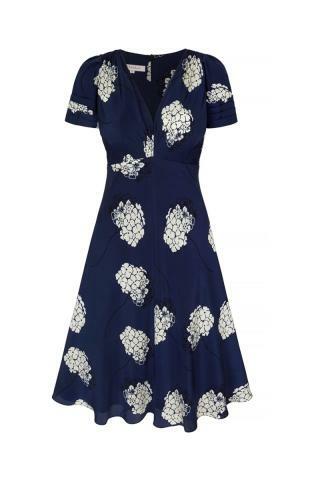 Above to the left the floor length Gabriella dress in blue tile print is a perfect piece for a drinks party in the summer and would look beautiful on hostess or guests. The tile detail is intricate enough to catch the eye but not over powering. To the right, one of my favourites a floral print dress that takes it's inspiration from the paintings of Monet. The Henrietta Organza dress is a light floaty dream of a piece and the naive style design gives it a playful feel. Perfect to make an impression at Summer parties. The Lily Henri print short dress to the right is another easy to wear piece and could be worn from day into early evening at drinks parties after work or for social events in the day time. It looks sweet on it's own but will accessorise easily with a jacket and smart bag like the rest of the collection. To the right the classic Beulah Sabitri shape morphs into the Monet print with delicately floating layers and the Sabitiri button detail it's a classic that you could wear for many years. The Monet print features again in the Valentina cross neck dress. 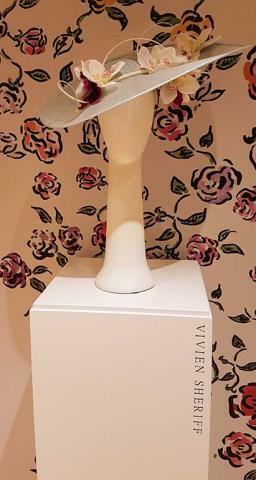 Shaped to show off the delicate curves of the figure. With a ribbon at the waist and pretty flounces of material at the lower neckline it's a flattering contemporary design that could be worn at many events. The Henri ruffle shirt dress in Maia style to the right is a myriad of delicate blues giving a cooling visual stimulus to the eye on warm days. Centre above the Henri print dress in Keziah style brings hints of craft-work into the design of a fun piece. It's neighbour to the right with it's slightly more subtle embroidery detail is equally charming and both would be wonderful to wear for summer picnics or countryside adventures. The vintage style embroidery shirt is a trend that will never date and the shirt dress to the right takes the best elements of blouse style with fluting at the elbow and then extends it to create a beautiful full length look. Like all of this Summer collection, it's light and easy to fold up and add to the travel bag. The coral tile print bell sleeve dress in Angelica is another smart working or leisure wear piece that represents how easy a shift dress is to add to the wardrobe. The harmony of the tile print offers a natural simplicity of design that is easy to style for many occasions. With the new Royal Ascot dress code allowing jump suits, this styling favourite has had it's horizons expanded further. This casual look originating in the 1940's and re-awakened in the 1970's is now very welcome in the Royal enclose. Styled with a jacket or wrap the Zig Zag print bodice jumpsuit in Susannah style is a timely addition to the seasonal collection. The coral tile long dress with V-neck is a timeless classic that could also be worn in countries with a culturally sensitive dress code too. The Helena hammered silk satin hemmed cape dress in blush pink is another favourite piece of mine looking ultra sophisticated, you could wear this to a friends party or a wedding or summer evening concert. The Henri print dress in Delphi is a perfect fun summer piece that will slip easily onto a list of workable Summer staples. Tweed plays a beautiful role in this collection with a light bespoke weave in pink and navy that is both light but woven closely enough to keep the wearer warm. Above to the left the Martha tweed jacket teams with a navy light blouse to form a light suit with wide culottes. Centre above the Seraphina dress in pink and tweed navy is a flexible summer piece that will also keep your warm on breezy days. As this season is starting on a cooler note, it looks like a great idea already. Another Beulah signature style the 'painted lady' long line dress returns in blush pink for a light variation on the classic House design. 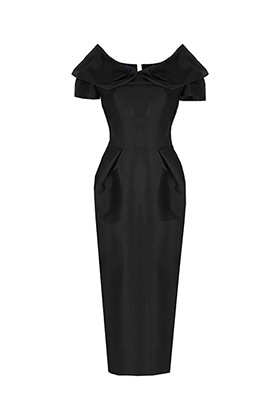 Also available in navy blue and scarlet it's another timeless evening wear piece. Worn alone it looks beautiful but will coordinate well with a jacket or wrap for evenings. Also featured are a number of beautiful light blouses and tops available in the Rouleaux style working the prints above and also in beige navy and organic cotton. The Monet print and the vintage detail embroidery print are my current favourites. They also have a beautiful light blue tweed jacket above to the right that will accessorise easily with many different pieces. Some readily coordinating skirts are on hand with the Tulip Navy A-Line skirt a popular version of the Navy dip-hem skirt that came out a few years ago. In March 2017 Natasha, Lavinia and their colleague Sophie visited Jaipur for an editorial and shoot with London's ES Magazine and celebrate the festival of Holi they saw many of the tiles that had influenced the design of the collection. This was followed by a journey again to Kolkata to visit the charity Freeset Global and see the new 2017 version of the Beulah canvas bags being made by women who had formerly been the victims of trafficking in India. The scale of the trafficking in India is immense on a par with Thailand if not greater but it's not so well known worldwide. Many women from poor uneducated families are forced into this way of life at a very young age or have no other means to support themselves. Freeset offer women a viable way to break the poverty cycle giving women bank accounts, health insurance and teaching them skills. Other charities such as Youcanfree.us teach women the life skills including psychological empowerment that they will need to rebuild their lives and carry on into the future. Natasha and Lavinia also visited the Women's Interlink Foundation that is working on integrated women and child community projects. They promote literacy and offer women routes into professions that will sustain them. Natasha and Lavinia saw women learning silk block printing by women learning the process of textile production and also women who where training to become chef's and make jewellery. The change and possibilities that now lie ahead for these women once they are able to work and provide for themselves cannot be underestimated. Nats, Lavinia and Sophie where moved and energised by the stories that they heard to continue their work. Lavinia and Sophie travelled to a project called Tharapana Swallows that that works largely with war widows and women who are affected by violence and may be also economically disadvantaged. Two gentlemen travelled from Bangladesh to Kalkota to meet them and show the beautiful embroider, garments and hand spun fabrics produced by the women that the Beulah team hope to introduce for the Spring Summer 2018 collection. Amongst the many inspirations for the SS18 collection and with a visit to a woman known as the 'Queen of Kantha' the traditional embroidery techniques. Beulah contributes to this vital cause to offer women hope and their beautiful clothes are a way of providing women with hope and a new path. Ascot unveils it's 2017 Dress Code, hats, racing fashions what's new for this Summer for Royal Ascot. In the UK Royal Ascot is part of our collective heritage. Founded in 1711 by Queen Anne, it's one her greatest legacies to the country, a way to have fun. 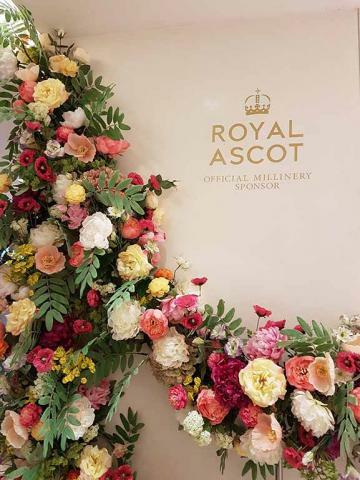 We start hearing about Ascot when we're small seeing pictures or meeting adults in immaculate clothing on those special days and the memories blend together to form part of the mystique. The world's most glamorous race meet doesn't rest on it's laurels though. History is there and pageantry with the Royal Family arriving in their carriages but it's also keeping up with the times as part of the contemporary London Summer Season where Royal Ascot makes it's presence felt as an international fashion and social spectacle on a par with London Fashion Week. As ever though this is the home of elegance and to be honest I don't think it's stuffy, if anything the rules are there to help everyone look better and dress in a more flattering way. It's not a beach party, it's Royal Ascot (you can party in a bikini later if you want to). Hat by Harvey Santos, dress 'Obsession' in silk Gazzar by Suzannah, earrings by Garrard, shoes by Cassedi, clutch by Sophia Webster. 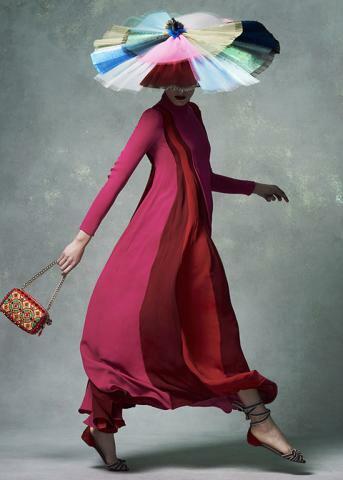 Hat by Noel Stewart, dress by Valentino flowng elegantly, shoes and bag by Christian Loutboutin. Hat by Emily London. 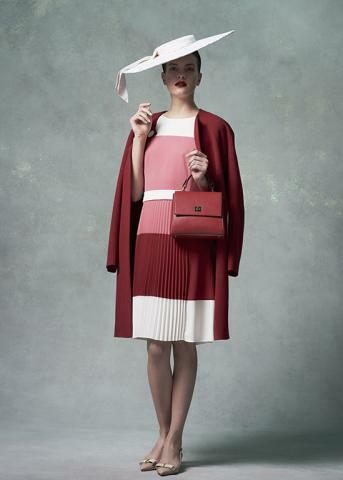 Coat, dress, shoes and bag all Boss by Hugo Boss. Hat by Sarah Cant. 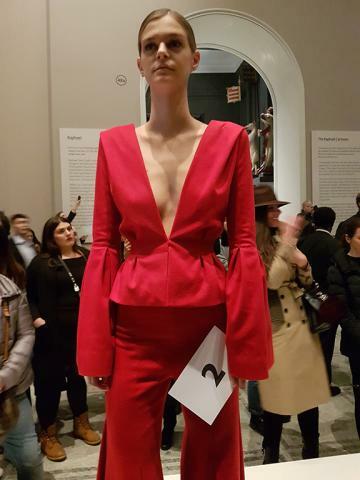 jumpsuit by Emilia Wickstead. Shoes by Sophia Webster. Total look excepting watch and shows by Oliver Brown. Watch by Longiness and shoes by Ludwig Reiter. Her look, hat by Ewon Golding, jumpsuit and shoes by Boss. His look, Boss complete outfit. Hat by Stephen Jones, dress, Luisa Beccaria, shoes by Tabitha Simons. Hat by Merve Bayinder, dress by La Mania, clutch by Elena Ghisellini. Shoes by Roger Vivier. Hat by Jess Collert, Ted Baker coat and bag. Dress by Reiss, Shoes by Tabitha Simmons. Jacket, trousers and tie by Reiss. Shirt by Ted Baker, shoes by Kurt Geiger. Hat by Jess Collert, dress by Coast, Shoes by Rupert Sanderson, clutch by Paula Cademartori. New for 2017 the Royal Ascot officials and arbiters of style have allowed the jumpsuit to be worn in the Royal Enclosure. It adds another option for women and this look has been worn in various forms since the 1930's but became popular in the late 1960's and early 1970's. For the Royal Enclosure, where you arguably have the strongest feel of history inside the modern building, there are many classic lines of style that you can turn to. Dresses, coat dresses and skirts should fall to no higher than just above the knee. Dresses and tops should have a shoulder strap of greater than one inch but in all seriousness I personally recommend going traditional again with a jacket or pashmina wrap to cover up the shoulders. Frankly on a wind swept race track or in the galleries high above it, it's just sensible and it gives you so many more ways to put together a stylish outfit. Plus, you can always remove the extra layer if you need to. Trouser suits are permissible in another no to the modern age but they must also be floor length. But just as in the days of celebrated Dandy Beau Brummell decreed the dress code for Men in the Regency period, fashion and the exploration of colour, style and taste is to be enjoyed. It's perhaps the most well behaved fashion party that you may ever go to. From the Style guide above, I noted the number of looks in red and shades of red, composed as suggestions by the Ascot and Goodley Bullen PR teams. Be bold and go for it are great words to remember. You can use colour to make strong style statements without breaking the rules. The Queen Anne and Village Enclosure's have a slightly more relaxed set of rules leaving a little further scope for experimentation. 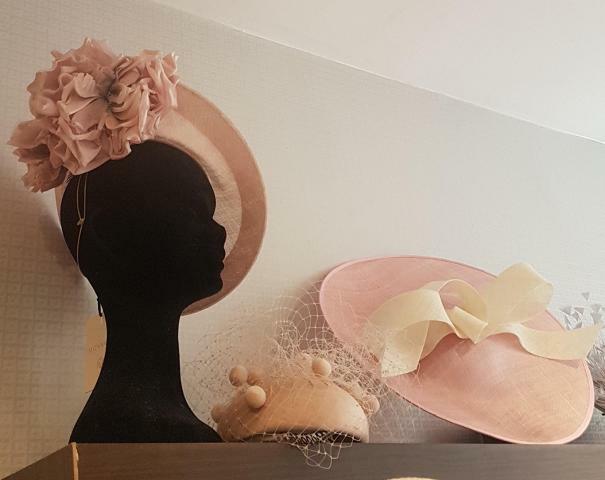 Ladies can wear a hat, headpiece or in fact a fascinator but, I would suggest a hat is much more fun and hat shopping although can be a little daunting at first is actually one of the most fun things you can do when styling a look. For clothing generally the same rules apply otherwise as in the Royal Enclosure except most noticeably for men the suit rules a very much relaxed, although guests are very welcome to wear traditional morning suit too. Whether you're at the races with friends, family or a special person it's important to feel comfortable in your clothes, and for me that includes shoes too. You'll typically be there from around lunch time until late afternoon and if you add on the journey time to get there it's about 8 hours or so in your kit. So be sure to think about comfort when your putting your look together. 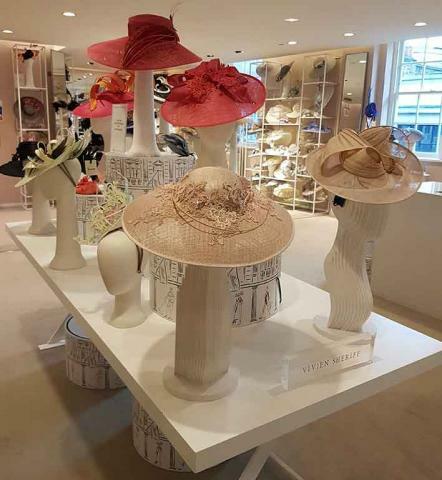 Try and physically take a dress in a canvas bag when visiting a hat department or milliner, walk a bit in the shoes in the shop and please always have a 'dress rehersal' at home. This is what I do in a try-on session at home. Walking around, moving and sitting to make sure an outfit is comfy from all angles. It may seem geeky but really key preparation for an important event in a new outfit and will set you up for the day. Also include jewellery in this to make sure you have the right balance of pieces to blend and not overpower the effect of the look. While in the annual guide from Royal Ascot there is an emphasis on high fashion appearing in the Royal Enclosure with chic High Street fashion in other enclosures, what's key to remember is that as long as you follow the right rules for the enclosure you are heading to, you can wear either Coast, Reiss, La Mania or designers showing in the international collection schedules. It's also a nice occasion to commission a bespoke piece for. 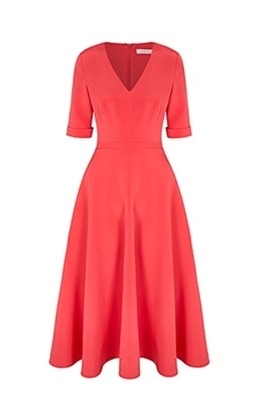 In terms of the dresses that caught my eye in the 'Royal Encosure' section Suzannah and Roksanda are long term favourites of mine and for the gentlemen, Favourbrooks of St. James' is a fascinating place to go to. 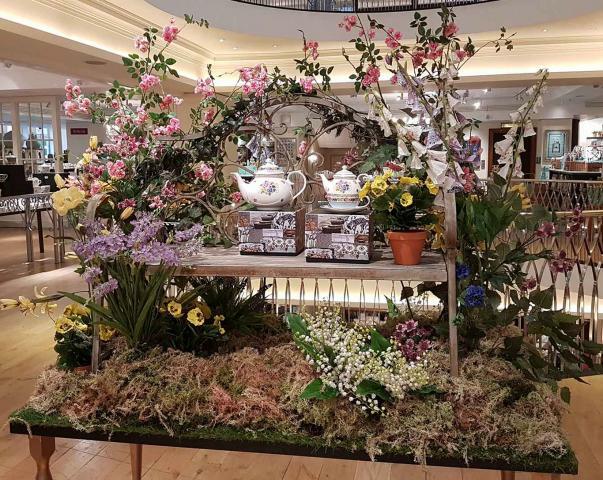 Based in the Piccadilly Arcade between Jermyn street and Piccadilly it's easy to find if your visiting in London and a handy stop off if you are between meetings or appointments in the West End. 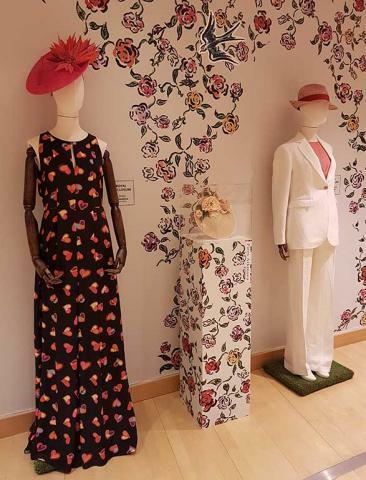 After several decades of growth helped by mentions including in the film Four Weddings and a Funeral in the 1990's, the team are now also producing womenswear collections that more than fit the bill for Royal Ascot's style requirements. 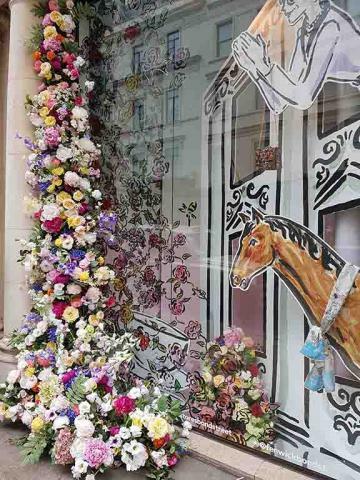 To get into the spirit of The Season Fenwick’s of Bond Street got into the mood with a display in partnership with Royal Ascot. 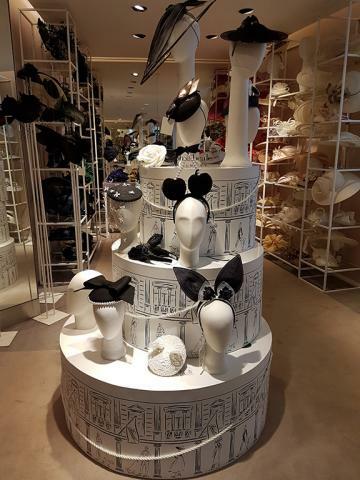 The pieces available to buy from the most well-known milliners in the UK including names such as Philip Treacy, Stephen Jones and Vivienne Sheriff. 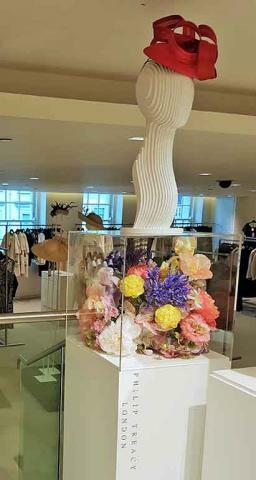 Centre piece looks are displayed on pillars giving the millinery the focus as a piece of art and design that it deserves cleverly positioned at the entrance to the millinery department in a spot visible across the whole floor. 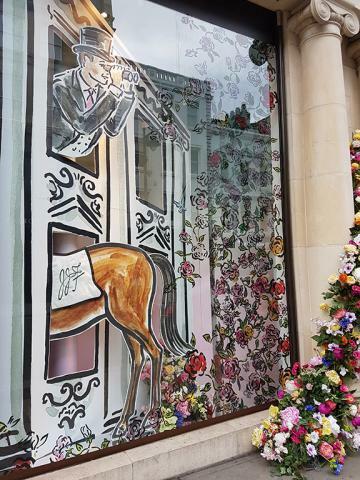 The widow displays have been decked out with charming naive style cartoons depicting all the fun to be had at the races with fresh day time florals displaying in bowed sashes delicately framing the windows. 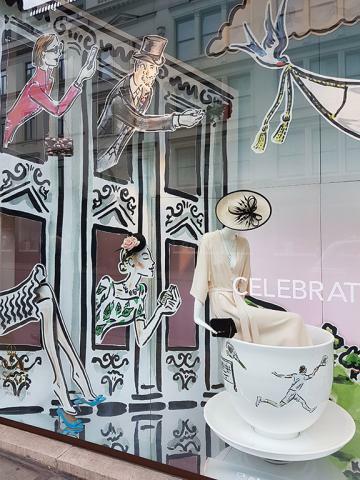 It's a perfect echo of the playful fun that we enjoy around Royal Ascot and the race season, it doesn't get more fun than spinning round in a giant tea cup and of course there is an analogy of sorts with 'Mad Hatters' and tea parties in that imaginary wonderland twist on The Season. I especially liked the water colour Horse. Horses are so special and feel so much and work hard during the racing season. 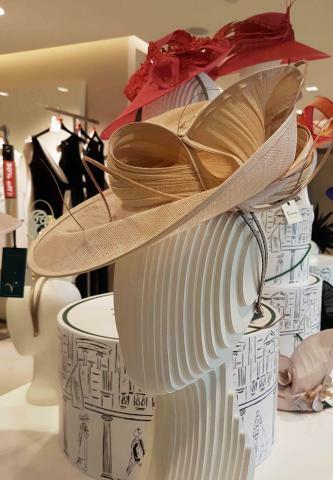 Hats are part of the DNA of Royal Ascot and also part of our collective social culture. 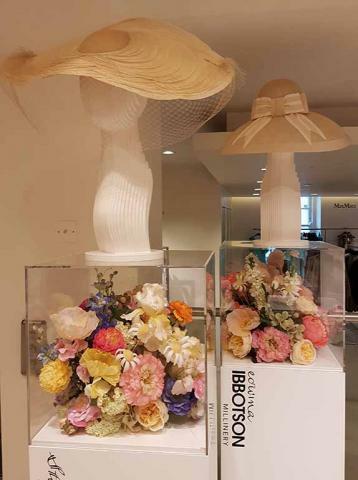 Each year the coverage of Royal Ascot’s guests’ style is beamed around the world. Fashion and sophistication have been at it’s heart for over 300 years. 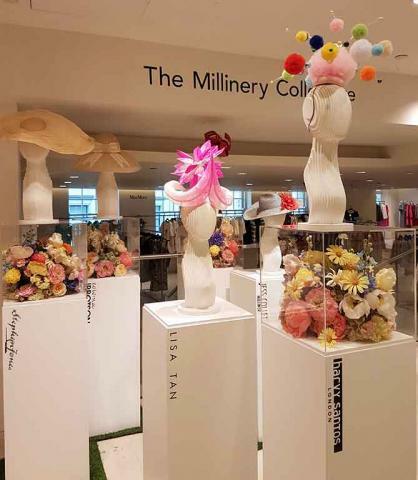 Millinery itself is in a very exciting healthy period in Britain at the moment with a number of established designers and also the Headonism Collective lead by Stephen Jones at London Fashion Week established several years ago leading the way in providing a platform for greater numbers of young milliners to show their work. There is no over all themes or styles that are in fashion at present as may have been in decades past. Instead there is a diversity of shapes, styles and brims greet the eyes of the visitor to the concessions. The variety and creative freedom that milliners currently have seems to be the main theme that comes across. Colours are bright and where used in many designs and fact not always needed to create a beautiful effect. 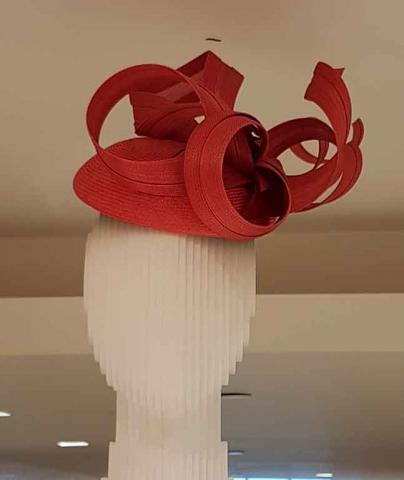 In the foreground you can see a crown devised by Harry Santos that forms part of the design of the leading Ascot Royal Enclosure style guide look above. It's frivolous and fun with it's own sense of contemporary expression. Perfectly suited to make an Ascot style statement Sophie Beale demonstrates her ability to play with shapes in a fascinating rippling grey ribbon like style gesturing to liquid forms becoming solid. 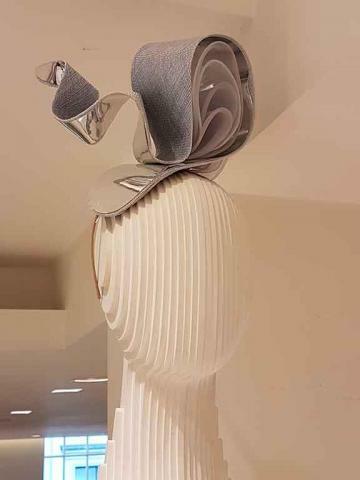 A light delicate crown with mirror-like finish on one side and woven fabric on the other resonates with contemporary sculpture and art installations. 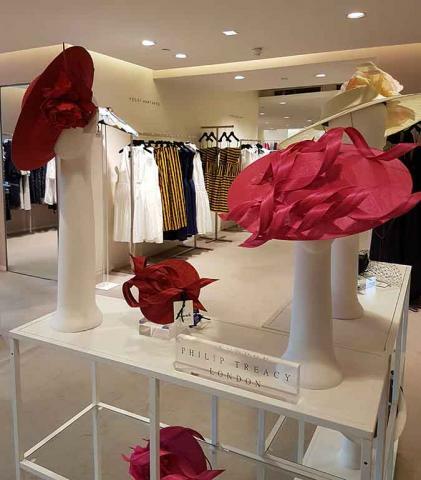 To the right in red in close-up the curls and swirls of Philip Treacy's style show the masterful ease with which he creates hats. 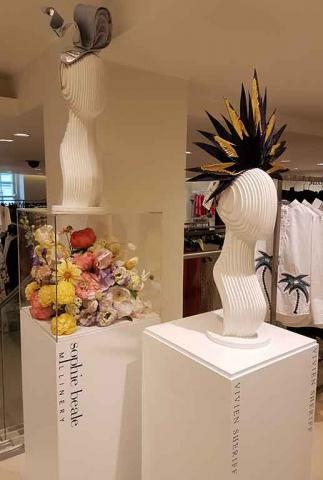 Hat in front by Stephen Jones and behind by Edwina Ibbotson. 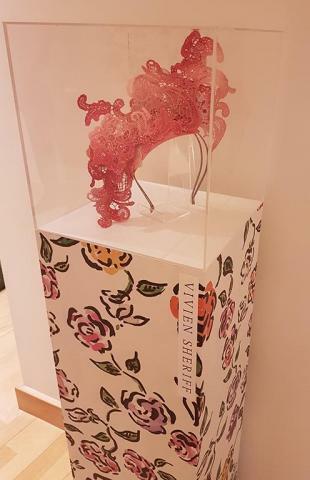 The lovely Vivien Sheriff who I was lucky to meet when she collaborated with the Beulah girls a little while ago displays a 'Liberty' crown style hat emulating the fiery rays of the halo of Greek and Roman gods and goddesses. In gold and navy the sophisticated colours mute the striking lines of the style and for a races statement at Ascot, Epsom or Goodwood it would be just the perfect thing. 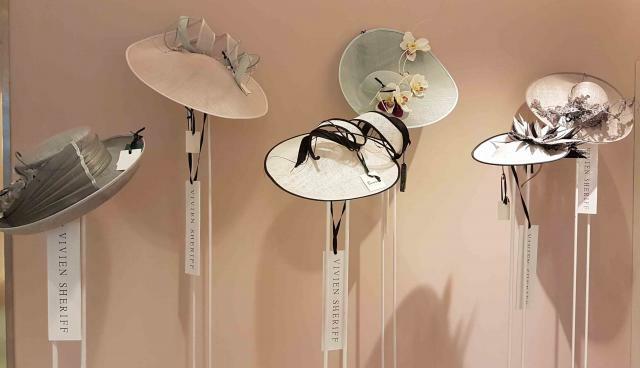 Against a wall and along a central table a line-up of beautiful hats by Vivien with broad brims offer a classic palette of style choices. 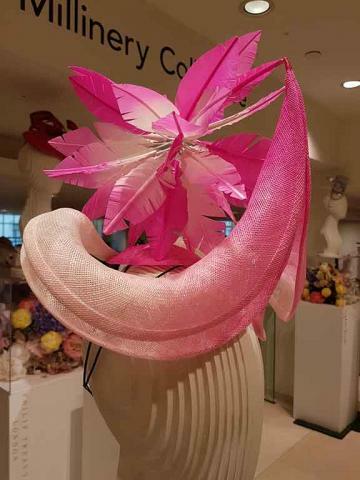 Flowers, feathers and ribbons placed around the crown offer a series of traditional looks that cater in a variety of ways for clients looking for more conventional looks. There are plenty of choices with varying angles and height suiting different face shapes. 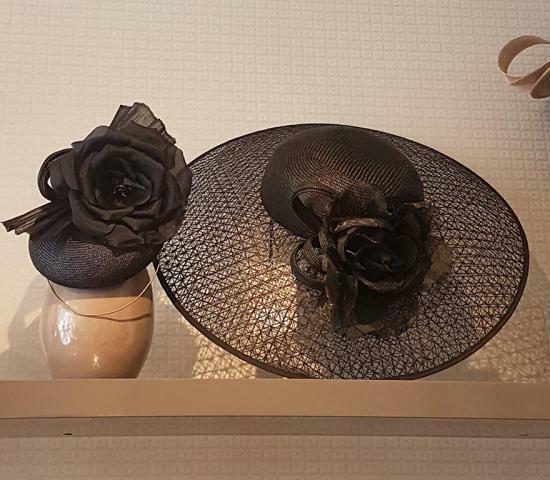 From slender cloche to broader brims all you need to do is match the style and colour to your outfit and then be as bold as your inner voice tells you to go. The key word above all with millinery is 'enjoy'. A hat looks it's best with a smile. Ladies being dressed by him over the past couple of decades. 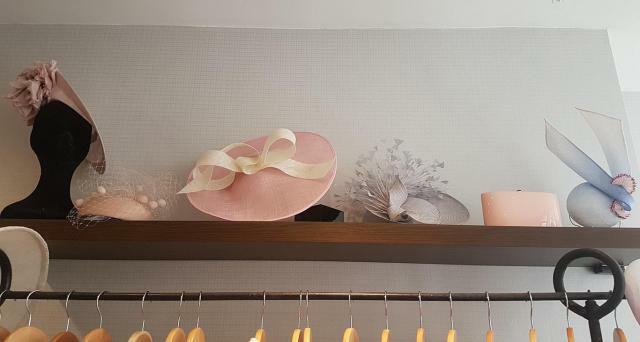 Even at a time when the British millinery cohort is growing strongly, Philip is still very much in demand and his Belgravia boutique in Elizabeth street is a popular place to find the style you may wish for. The curls of the red ribbon on the look above to the left is huge fun, playful and chic and a great piece to add with outfits of several different colours. 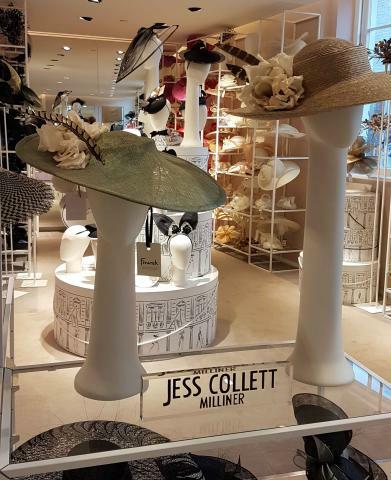 Jess Collett is another young British milliner who shows the repertoire of her skills at Fenwick's. Creating a series of styles, some more daring than others she works flowers into several designs here in a slight nod to the 1920's and 30's perhaps but with a fresh feel. To the right and below a number of looks from the millinery department that is frankly brimming over, (no pun intended) with style offerings running the whole span of conventional to playful and fun. 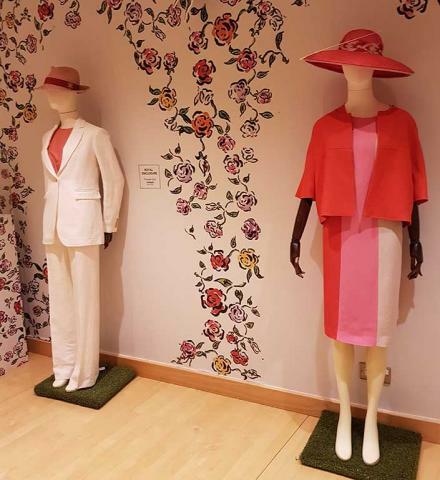 Note the bunny ears :-) This display is largely themed around colour allowing you to match a piece to your outfit perhaps first moving towards the colour that will coordinate best and then looking through the range of shapes. 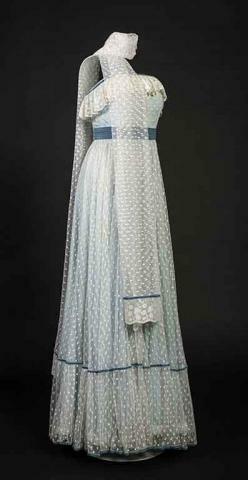 Suzannah Fashion - one of Britian's leading couturiers and formal wear designers. When thinking about The Season and designers who create fresh classic British luxury style Suzannah is a name that springs to mind. She dresses many high profile women in the UK. 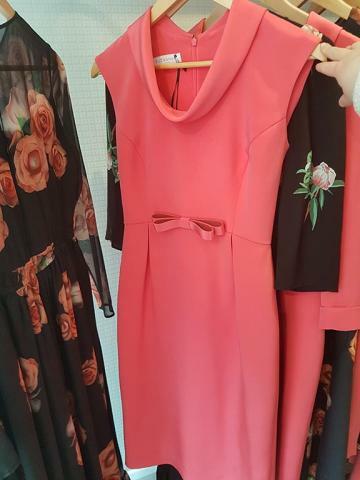 Suzannah Crabb has mastered the art of creating immaculate style for women who like attention to detail and want garments that will work practically as well as using the finest materials. Suzannah channels vintage shapes while blending in nuances of contemporary street style that she sees around her. 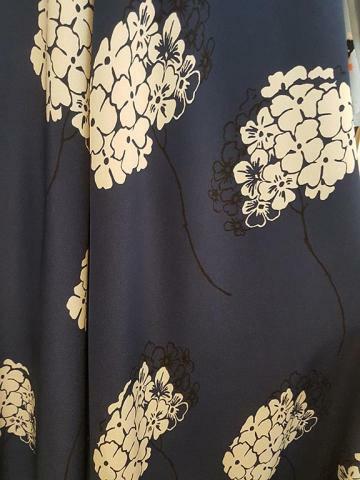 Her natural passion for fabric comes across in the repertoire of her work, winning her the admiration of clients including several members of the Royal family including the Countess of Wessex, the Duchess of Cambridge and her sister. Many international business women also rely on her to create the garments that they need for their wardrobes too. It's been a joy to meet Suzannah and talk to her about her work after admiring for ages. The wave texture stripe dress in Ivory. A beautiful silk top in Ivory and twill riding skirt in pink. The Jackie wool crepe coat and Leavers lace shift pink dress. An effortless Ivory shift dress. 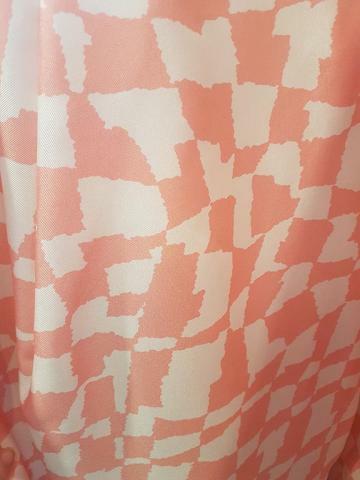 Morgan cape shift dress in pink and Ivory. Snap dress powder blue wool crepe. 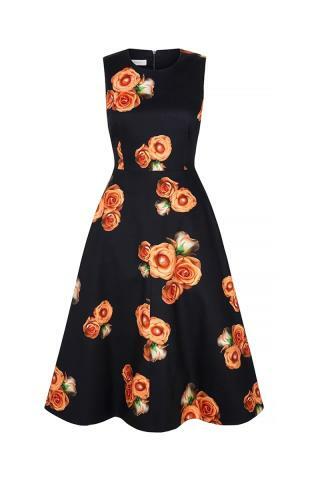 The tie front tea dress with miniature roses. 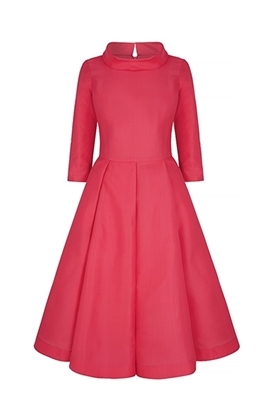 Silk cape shift dress in wink pink. 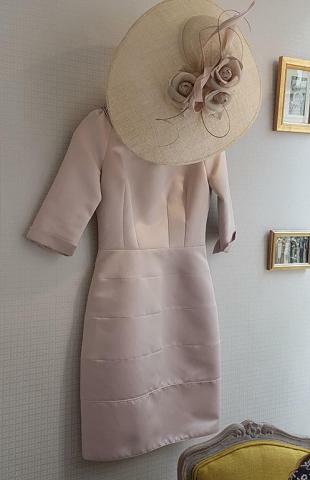 The Boo ruffle wrap dress and couture Suzannah hat. The Malibu boo collection offers a host of light feminine designs that will yield inspiration for special occasions. The texture stripe dress is a softer variation of the classic 'fit and flare' style shaped gently to the figure the skirt is cut to provide volume to just the right degree. Elbow length sleeves give it a 'complete look feel and you could wear this without a jacket for formal occasions with a hat and clutch purse. Chevron angles are gently flattering and provide extra detail. A silk top in ivory offers a sleeveless option for warmer days and evenings with it's shift applique detail, a delicate lattice variation of chain mail form that that catches the light. The dipped hem skirt in pale pink compliments in a contrast of colour and texture. Pocket detail, as with the ivory dress, gives a nod to the Haute couture expertise of blending high style and craft with practicality. The Jackie wool crepe coat offers a simple classic line complimenting the leavers lace shift dress in pink that could also be worn with a shorter jacket or wrap to suit the occasion or weather. It's an easily adaptable look for many occasions. 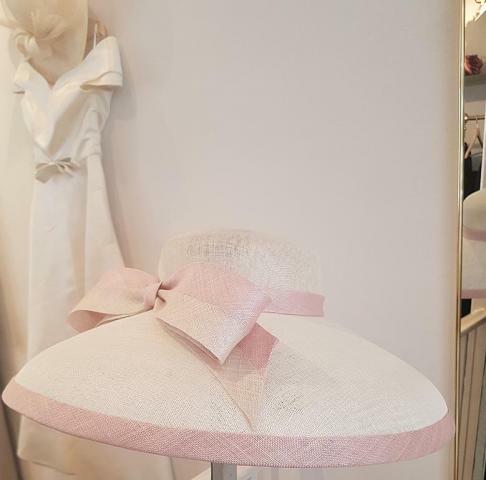 One of the most wonderful features about Suzannah is that she offers a bespoke service alongside ready to wear allowing clients the flexibility to order looks that was more common in the past. The effortless ivory shift dress is another classic wardrobe staple with fashionable bell sleeves and hem cut just above the knee, it's the perfect length for a classic 'day suit' look. 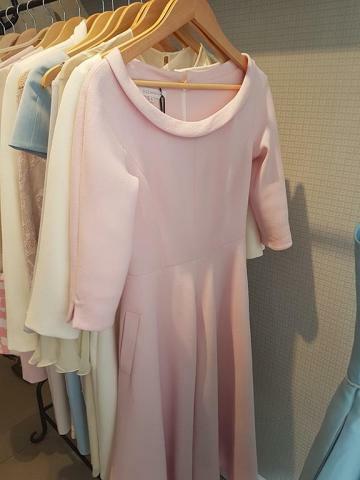 The Morgan cape shift dress in pink with ivory has a playful feel once again incorporating seemed pockets that hint of the 1960s in the contemporary dress. The caped shoulder detail still allows for plenty of movement echoing ancient anglosaxon mantles for a classic contemporary chic look. 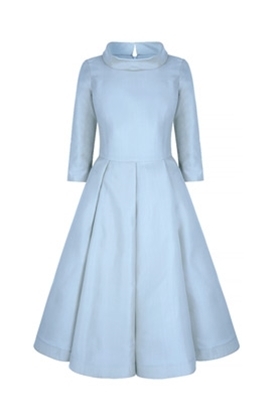 The snap dress in light blue wool crepe has a dainty bow added at the front of the waist. Suitable for both a formal occasion and social lunches and teas, it would also adapt well as a look for early pregnancy style. Offset beautifully by light blue shoes it's types the mood of comfortable elegance that Suzannah creates for her clients. 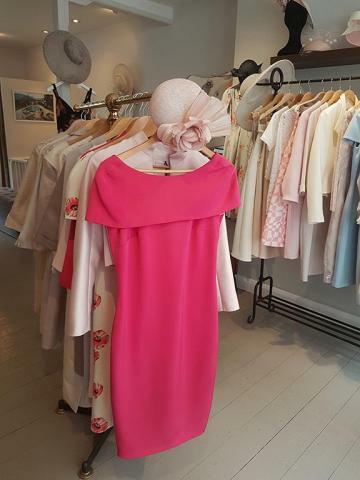 Suzannah's eye blends influences from across several decades evident in the 1940's inspired silk crepe dress in wink (magenta) pink. With a sash tie waist, the ease of form and style of this piece as it fits the feminine form is highly seductive. 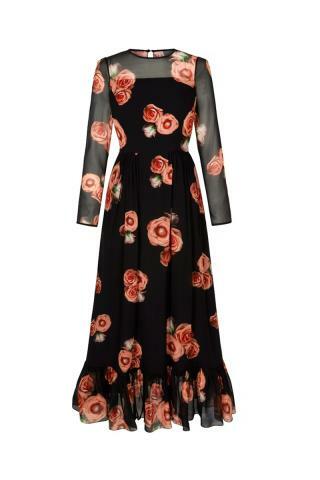 The tie front tea dress with miniature roses is an echo of this style. Again channelling a 1940's feel the subtle refined pin-tuck flatters the line of the figure gently enveloping the curves. The fitted front button coat dress in powder blue is the classic definition of a stunning formal wear piece. Lightly nipped in at the waist with front button detail and curved lapels, it's a sweetheart piece that still looks grown up and sophisticated. The caped shoulder detail returns in the shift dress above to the right, sitting lightly on the figure it will be comfortable to wear from through daytime or evening engagements and coordinate easily with jackets or wraps. The leavers lace shift dress in white. 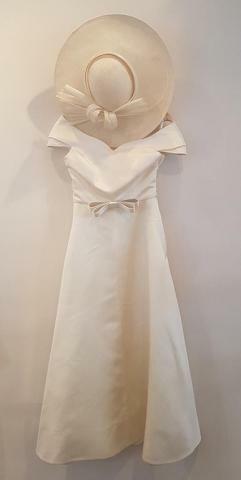 Doris Gazar bow tie dress. Silk tee and gingham skirt. Leavers lace shift dress in soft grey. Silk tea dress in hydranea print navy. The romantic undone collection for Summer 2017 features a series of single colour styles and a rhapsody of floral numbers that are a genius style find crossing effortlessly between formal wear appropriate for both the Royal enclosure at Ascot and also lunches or afternoon teas with friends across the summer. They're a hit for the wardrobe and as I mentioned chatting to milliner William Chambers who works closley with Suzannah serving the needs of mutual clients, her clothes are faultless in their design and style and for William she is a dream to collaborate with as other milliners such as Vivien Sheriff also find. 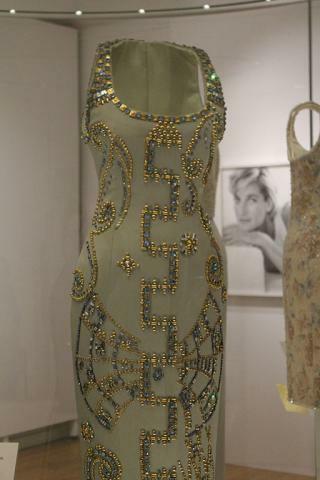 These are dresses to love and treasure created with evidence of Suzannah's well known love of textiles. Note the flair in the skirts ready to twirl or move as you walk. 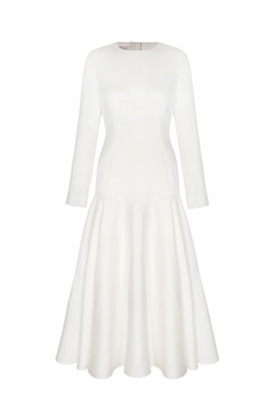 Silk Gazar Obsession Ballerina dress - from the romantic undone collection. Above the Boo ruffle wrap dress is an ode to romance with soft delicate ruffles at the neckline and light frills at the lower sleeves above the elbow. With it's coordinating couture hat it shows that there putting the right pieces together to create your ocassion look need not be daunting. 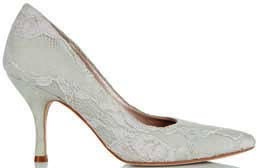 The leavers lace dress is shown above here in two variations of white and soft grey showing how one shift dress style can be used for different effects by shifting the colour slightly. The doris gazar bow tie dress in pale blue captures the romantic nature of the collection with the pretty bow adding playful neckline detail. Flaring slightly from the waist it echos the early rock and roll years. Chic separates are always a good thing to have the wardrobe and the paring above of white silk tee and gingham skirt is beautiful to see and wear. With it's light contrast light fitted top and flowing lose skirt it's perfect for Polo, sumer parties and much more. 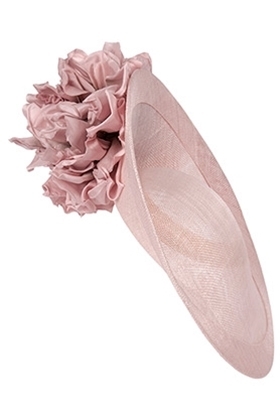 Floral side slice hat in pink. 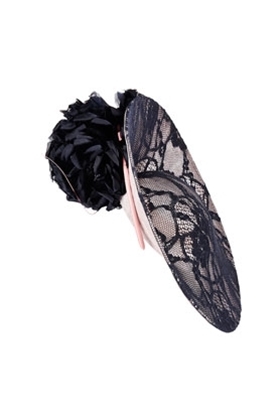 Floral side slice hat in lace. 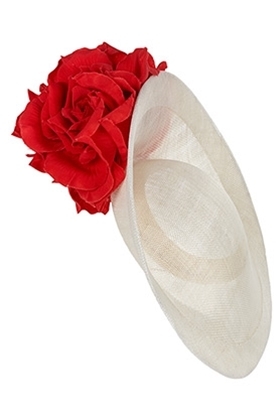 Floral side slice hat in red and white. 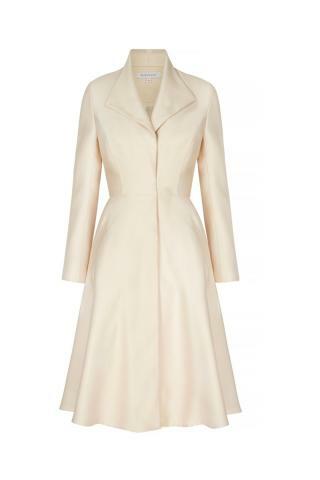 The Hunter Dress Coat in Peaches. The Mansfield Dress in Duchesse. 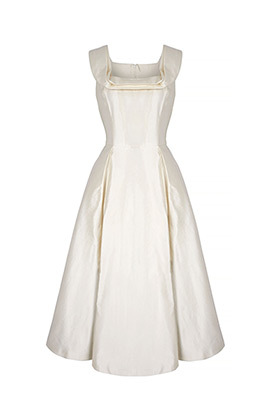 Couture Fifties Lucille dress in Ivory Sparkle. Silk Gazar Obsession Ballerina Dress in Cinderella Blue. 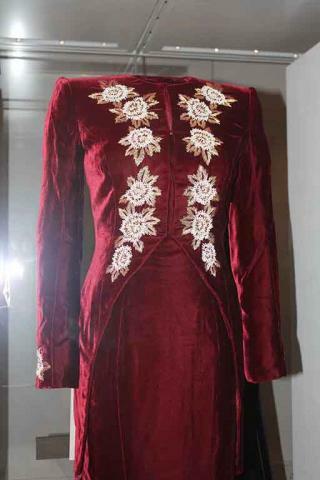 The Presidents Dress long Zibelline. 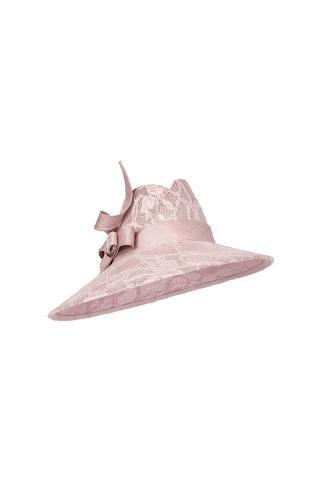 Hats are a key part of formal looks particularly for the Races, garen parties and weddings during the Summer and year round. 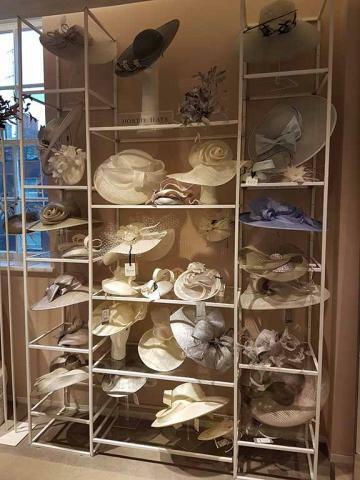 This summer collection of hats from Suzannah broadly compliments the styles that she has to offer her clients this season. 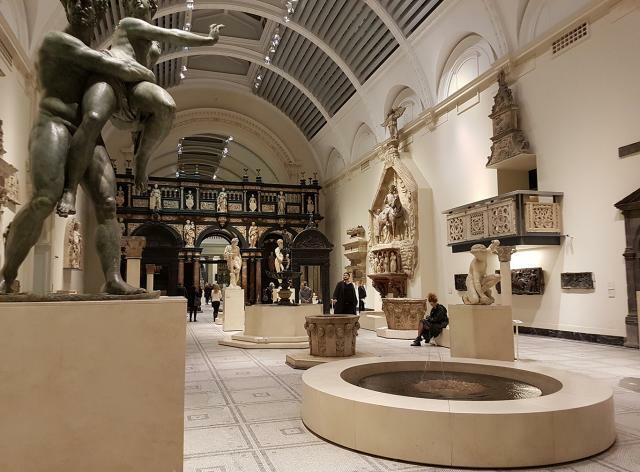 As already noted her collections are also perfectly accessorised by works of a number of miliners and another name that she knows well is Rachel Trevor Morgan who carried Royal license from Her Majesty the Queen. 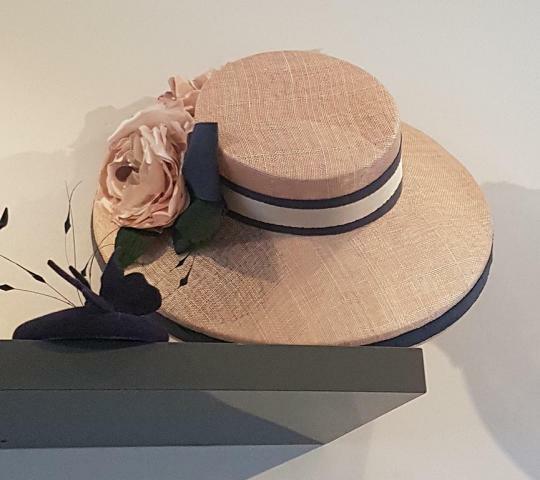 Suzannah has a range of millinery styles and you can see more further below in my shots from her beautiful Marylebone boutique where small brimmed and cloche styles sit on rails simply but effectivly demonstrating how they work with garments and outfits. Some rail-shots of beautiful looks from the Spring-Summer press day. style with the hand of a trusted designer. The riding dress style is a simple adaptable staple for the wardrobe across seasons and for the Summer bright colours are a favourite option. If you're looking for something very classic for the evenings the Presidents Dress with it's long angular lines is a reliable option. To the right examples of some of the accessories that Suzannah offers including fold-over clutch purse with appropriate heels. Here are looks that I shot in a preview of Spring and Summer last autumn that where a beautiful sign of the Floral prints coming for this season. 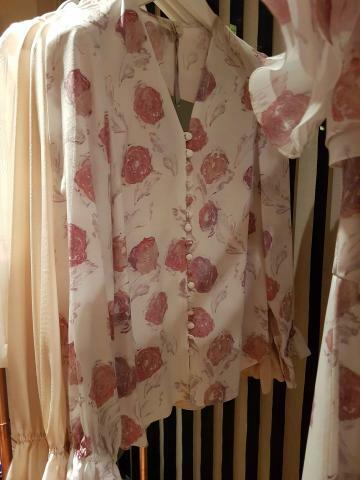 To accompany the Apricot rose print dresses above there is a beautiful blouse that is light as a feather with pretty ruffle details at the front. 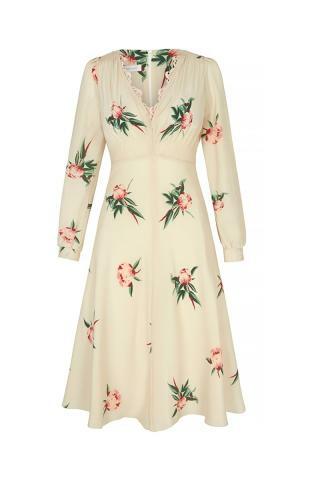 The Florals of the Fejus dress above look beautiful in again this piece like the others is beautifully light weight and easy to pack for travelling. Amongst the High street brands in the UK there are a number of possible options for smart occasions; one brand however seems to have the edge over others and that's Coast. Coast is a young label that has a fantastic selection of looks for races, weddings, and the formal social rounds. These are always looks with a great sense of fun about them that you can dance and party in and the Coast collections cover a series of moods that have a different feel so you can chose from a broad selection. As well as having their own stores Coast retail in department stores creating further one-off designs for the Debenhams and House of Fraser chains giving shoppers a huge selection from the coast classics. Above to the left, the first three looks shown are from a collaboration with the RHS to celebrate the Chelsea Flower show 2017. 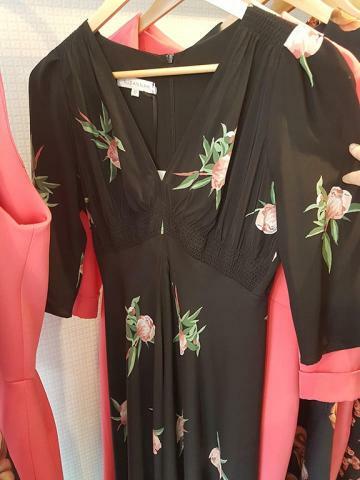 Bursting with floral life in a restrained sophisticated tone, the dresses include one in the centre that features looking perfectly chic in the above Ascot style guide. To the centre and the right more looks in bold colours and patterning include culottes and pencil trousers catering to a broad series of tastes. Fit and flare style dresses sit alongside a bow-tied bodice coordinating with a full length pleated skirt. Note the large white cape sitting on the mannequin centre above, it would work with many looks. The palette of look moves through more subtler shades with iced tones providing a contrast to the bold Florals. You can go in one direction or have both at your disposal. What always impresses me about Coast is the choice of fabric and attention to detail in the designs. For a retail market high street label they need to keep clothes around an affordable price point but they produce styles and designs executed to very high standards. Centre above I wanted to show some of the golden embroidery detail that is used in the skirt to the left. Shimmering gently under the light is has an almost rippling liquid like appearance when the garment moves with the wearer. To the right more creative approaches to style forms show a structure based dress, pleats and an interesting layered bodice variation on the bandeau top design. 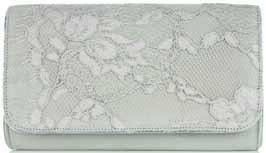 Flat line clutches seem to be the order the day with several appearing in different fabrics and tones through the collection. 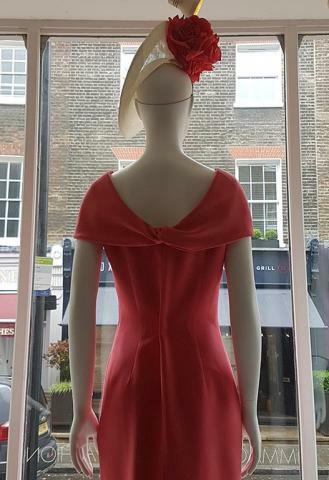 Suzannah's Marylebone boutique is a haven and a delight for the eyes when a client is looking for the practical benefits of the traditional couturier and dress making experience to suit their requirements for events or simple pleasure shopping. 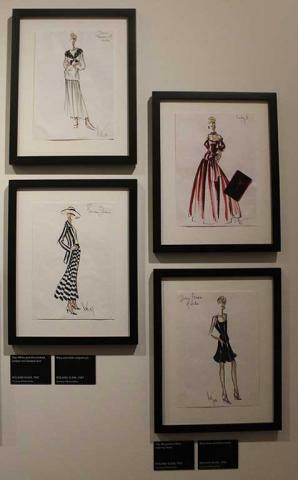 In a drawing room atmosphere she displays the examples of the garments that can be ordered by clients as well as some ready to wear pieces. It allows for more looks to be displayed to clients symultaneously and a further feature in her design offering is that clients can look through two or three different themed collections to choose their preferred styles. Suzannah maintains a direction of harmony in her portfolio of design that means it's possible to select looks from across collections to wear across a multi-day event keeping harmony. suit your mood. I come back again to wonderful feeling of comfort that the boutique has and to put my finger on it, it actually feels like you're in a private, rather extensive dressing room rather than a shop. These clothes are not inexpensive but here you can easily see how they become part of the back-drop of the life of the client. Center above and also below some close-up fabric detail from the garments in the current collections. The gingham skirt detail is uniquely patch worked in unique inexact shapes making it soft in appearance to the eyes from a distance. Florals below in diverse patterns are finely executed on the fabric with digital level detail and are created with variety in the shapes of design. 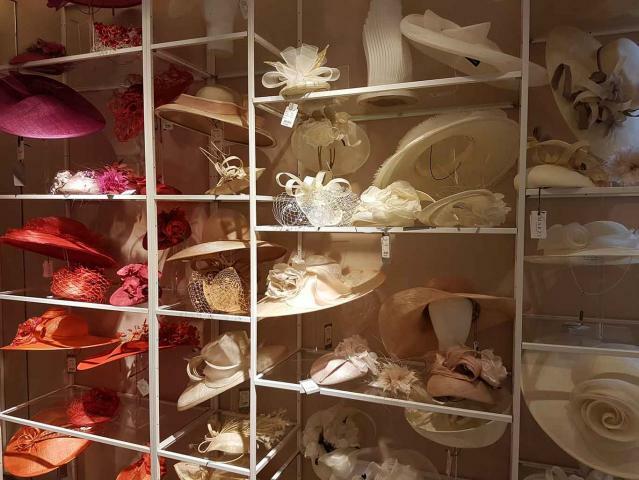 Hats are displayed throughout the boutique coordinating with nearby dresses and outfits. 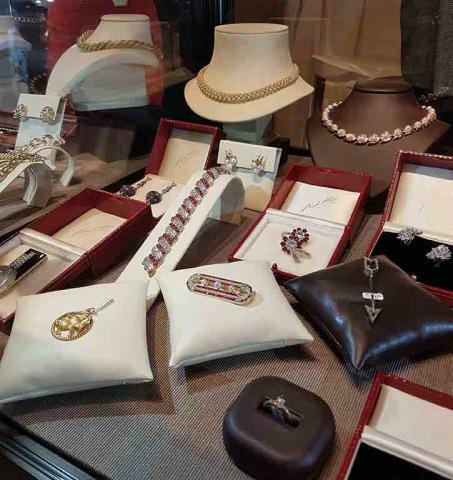 You may come to a boutique like Suzannah with a specific event in mind that you need to buy for, and even if you have a certain style and look in mind, it's worth just pausing for a minute to see what other shapes are there too. 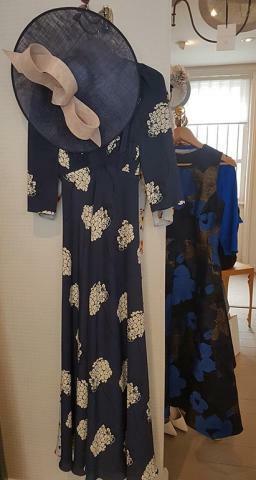 I was particularly taken with the powder blue designs that felt like a new discovery after admiring Suzannahs' beautiful prints and styles in many of my favourite colours. 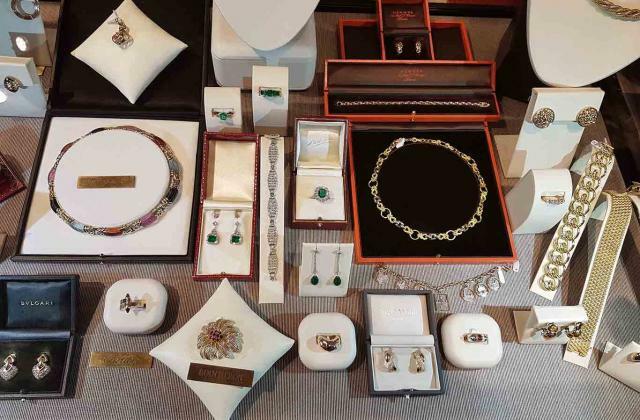 The experience of choosing a piece from her and her team feels personal and gentle with no pushiness and an emphasis on finding a piece that will match your needs. It's shopping as it should be and it's a team that know how to dress you. 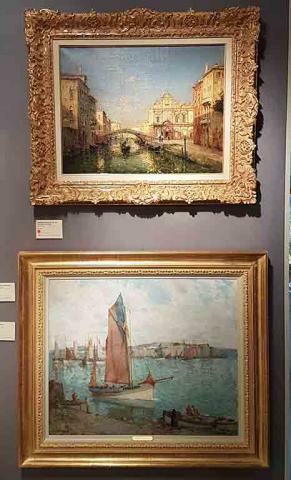 In spring each year one of London's most well known art and antiques fairs arrives in the Duke of York Square in Chelsea for a week traditional art and antique sales. 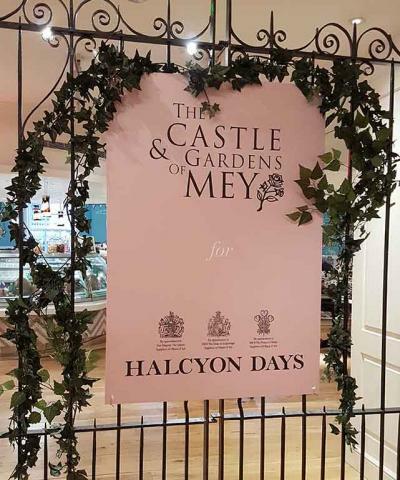 Halcyon Days and The Castle of Mey celebrate the favourite flowers of Queen Elizabeth the Queen Mother. 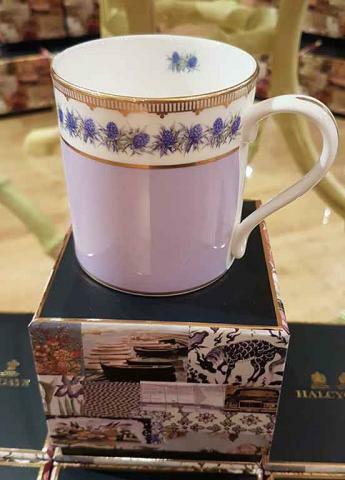 The British fine china company Halcyon Days unveiled it's new collection of ceramics at Fortnum and Mason on London's Piccadilly designed in collaboration with the Castle of Mey & the Gardens Trust. On the north coast of Scotland, it was formerly the holiday home of the late Queen Elizabeth the Queen Mother. My picks from the Autumn/Winter 17-18 collection press days in London and Bonhams sales. In advance of the Balenciaga: Shaping Fashion exhibition opening in May the V&A held a new installment of their Fashion in Motion series. 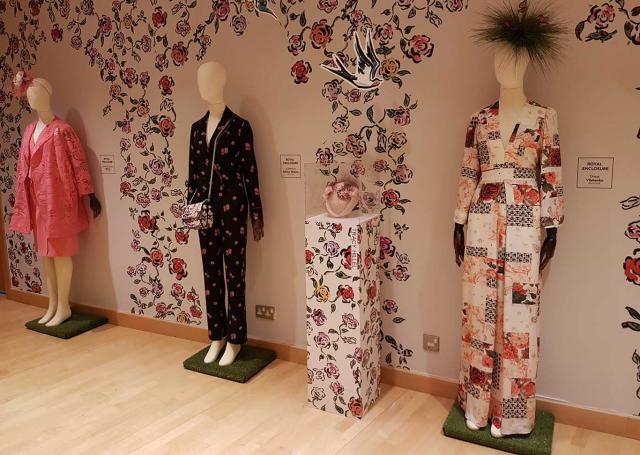 Previously designers including SIBLING, Christopher Raeburn, Ralph & Russo, Peter Pilotto and Henry Holland have taken part showing medleys of recent seasons collections to showcase their work. 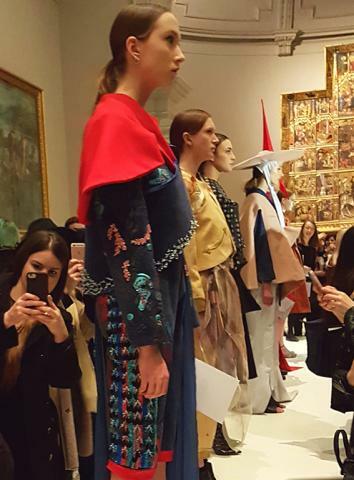 This show took an intriguing different angle and showcased the works of students at London's Central Saint Martins' Fashion College created in the style of Balenciaga. 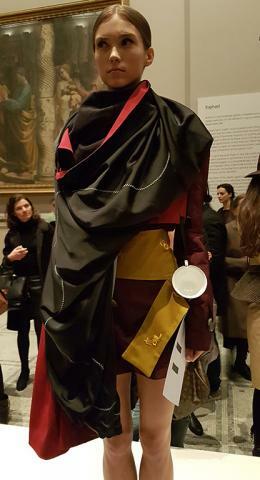 The clothes where shown by walking through the ground floor of the museum ahead of displaying them in static pose in the Raphael Gallery. This eye catching contrast between the old and new served to demonstrate how Balenciaga, now a name hallowed in fashion history is powerfully influencing the clothes we see around us in day to day life across the world. Balenciaga's deep interest and expertise with fabrics and his supreme tailoring skill. 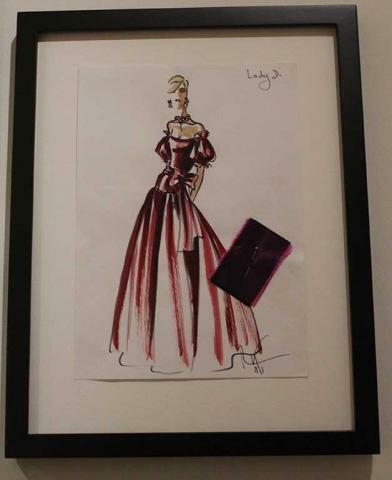 It's definitely a great education to be set the task of creating designs based on the skill and 'know how' of the man known as the master of couture and hopefully for these students have picked up some key skills for their future careers. 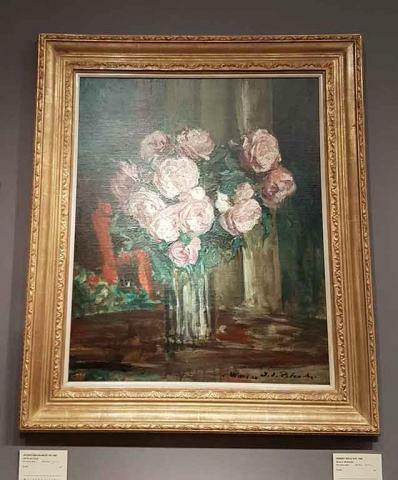 I don't have any dislike of contemporary art by any means but I find that traditional pieces really are great to relax and chill around and when you have a busy life. Pieces that are easy on the eye are perfect relaxation pieces. Above are pieces offered for sale by the Walker Gallery based in Harrogate. 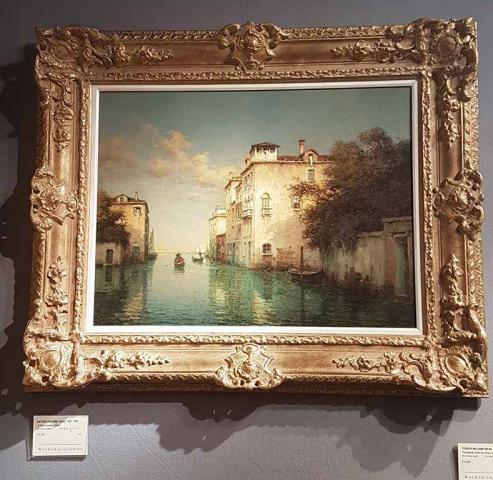 Classic scenes of Venice, coastal pictures, British landscapes and charming florals are also a canny bargain alongside the prices of many contemporary pieces in the current market, so for collectors from many walks of life who would like to own decorative art so while prices remain relatively modest it's not a bad time to buy. 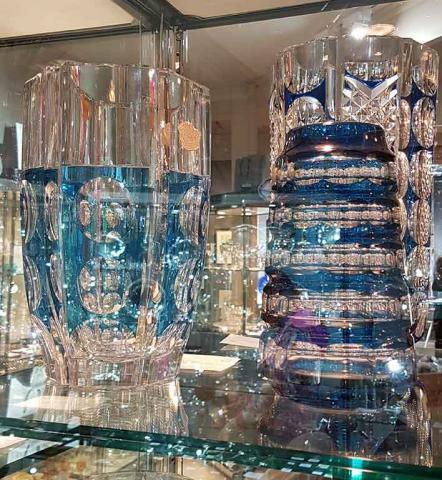 Glassware is another hugely enjoyable area to collect in and relativley inexpensive, it's a great way for younger art collectors to find pieces that they will enjoy. Mark J. 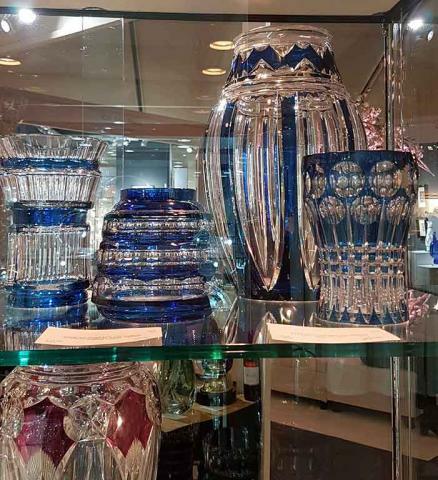 West offers a wide variety of glassware objects for sale to be used or for purely decorative. For many people it's a simple way of brighting up various parts of hte home as the vases, plates and dishes naturally reflect light and amplify the colours within. 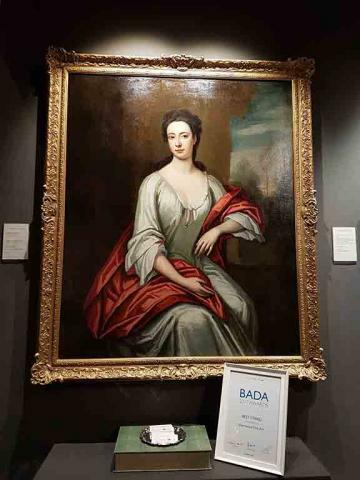 The BADA art fair alongside it's contemporary LAPADA fair and Masterpiece held later in the year also offers one of the most abundant places to satisfy your interest in antique and vintage jewellery. 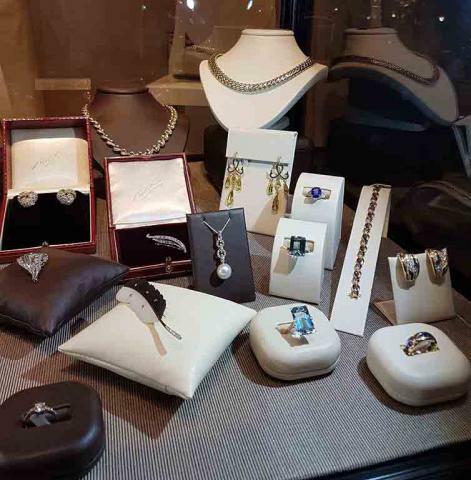 Pieces from famous houses of the 19th and 20th centuries including Cartier and Van Cleef & Arpels sit alongside works from other jewellers of no less skill and beauty. 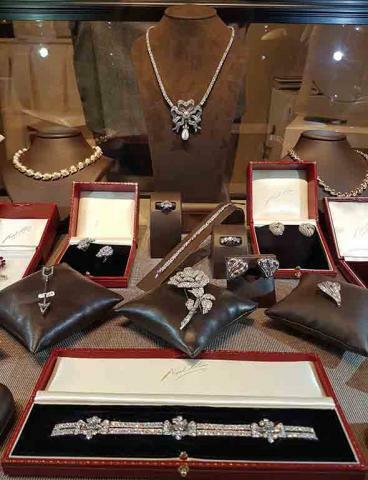 Buying vintage bespoke and Couture jewellery is a fascinating way to explore this wearable form of high art and craft and celebrate the work that has gone into the pieces. 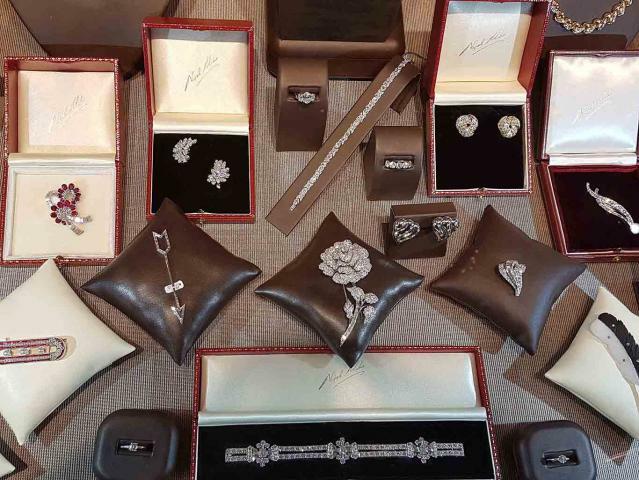 They make very special gifts as people often come across items that have a resonance for them and loved ones. It's fascinating to see the trends in style in this part of the luxury market as they have changed and adapted over the decades. Standing in front of the cabinets talking to the lovely husband and wife couple Nigel and Cherrie Milne based in Berkeley Square Mayfair it was clear to see their enthusiasm for the profession. Another one of the stall holders clearly having a good time was Nicola Isherwood of Isherwood Fine Art. 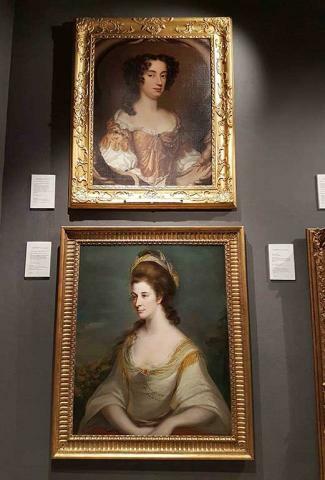 Having previously sold in Asia and Australia before returning home to the UK and settling in Bath she specialises in fine portraits from the 16th to 19th centuries. In her debut at the fair she won the 'Best stand' award from the fair judges and was clearly still quite surprised and happy when I spoke to her. It's hardly surprising although I don't envy the tough work of the judges with so many vendors selling everything from musical instruments, to clocks, cabinet and silver specialists. Nicola's portraits on offer are eye opening in terms of the quality that they represent. Some of the subjects look almost digital in quality to our modern eyes and it's astonishing to see how well, with a bit care, the colours can stand out so brightly in the works. One notable artist who has several works in circulation at the moment with different vendors including dealers is female portrait artist Mary Beale. Two of her works, shown in cartouches below show women with similar hairstyles and fashions of the day showing Mary's popularity as the 'go-to' artist of the fashionable set of the time. I found myself mesmerised in looking at the incredible execution of the fabric work in many of these pieces. 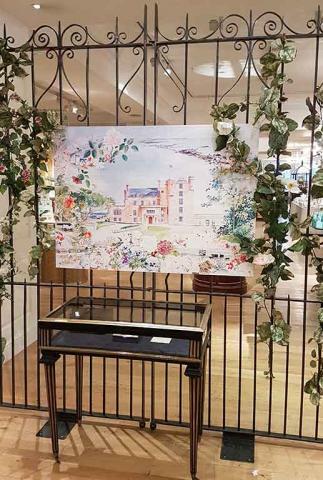 A beautiful display greeted vistiors as they arrived on the first floor of the department store now owned by the Weston Family and thriving past it's 300th anniversary in 2007. 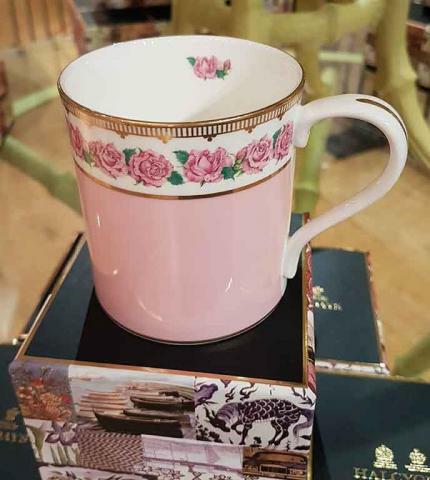 The collection celebrates the favourite flowers of the Queen Mother's gardens at the castle across a charming pastel colour scheme. Flowers from the shell garden thistles, roses, primula and nasturtium all combine to give an impression of the colour and scent palette that the Queen Mother created with her garden team. The colours are light and joyous and it's a wonderful collection the have around the home to celebrate the sunnier lighter days. 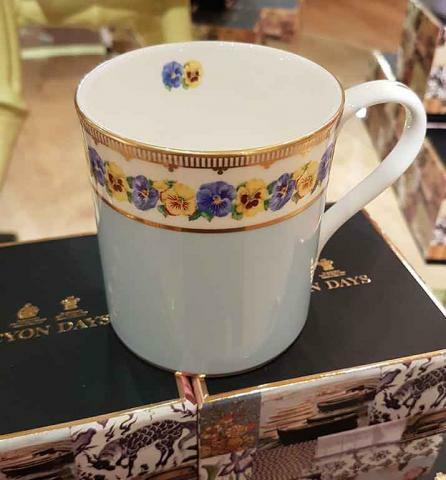 As ever Halcyon Days pieces make great gifts and a special addition to your own china collection. An illustration of the Castel of Mey above a cabinet showing objects from the John Gubbins collection. 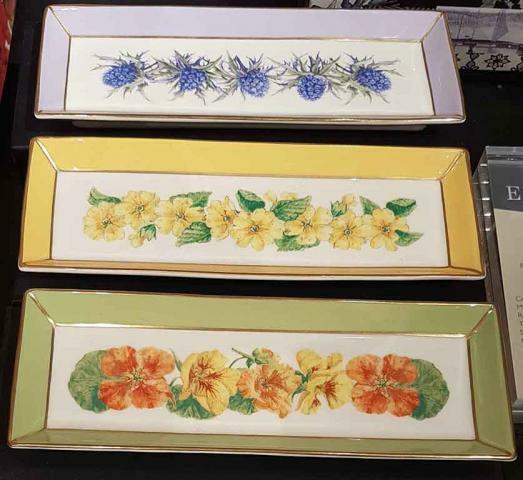 Shell Garden Floral Long trays in Thistle, Primula and Nastortium. Shell Garden Tea pot to the left and the shell garden Teapot for One cleverly incporporating a cup and saucer. The company is passionate about supporting British craftsmanship and preserving traditonal techniques (as am I) and I was lucky to speak with several members of the team before Christmas and learn about their work with factories in the UK and how a steadily growing workforce is continuing to produce what would otherwise be a dying art. Preserving craft provides jobs and skills and a long term career. There seem to be so many benefits not just in the beautiful things that they produce. The team work very closley with the midlands factories and see the teams their often, posting scenes from their visits on social media. Halcyon Day's market is growing internationally and interesting the French are great admierers of the brand, our closest neighbours. I think that creating a tea set around such a beautiful project as the Castle of Mey Gardens creates a conversation point before you've even begun to talk to whoever you're taking tea with and today, I think it's as important as ever to make time and sit with friends and talk over a cup of tea keeping friendships strong. 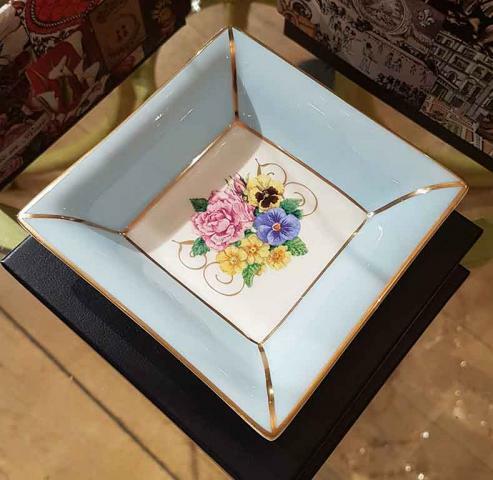 The long trays are crying out for Macaroons or mini scones, cakes or chocolates to be placed on them and are beautiful objects to have around the home or living space. As holders of Royal Warrents for five decades the company demonstrates lasting commitment to achieveing the highest possible standards in production and customer service. 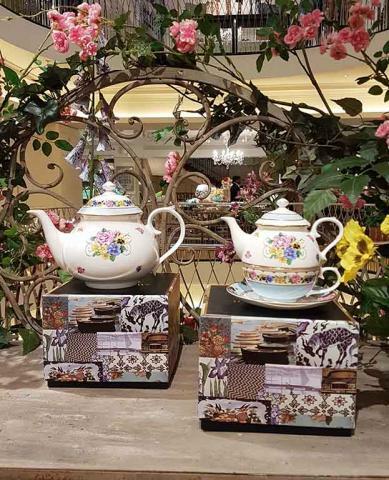 These delightful teapots on either side here are very beautiful and stand up to the chalenge of serving many pots of tea as well as being fantastic ornamental pieces. 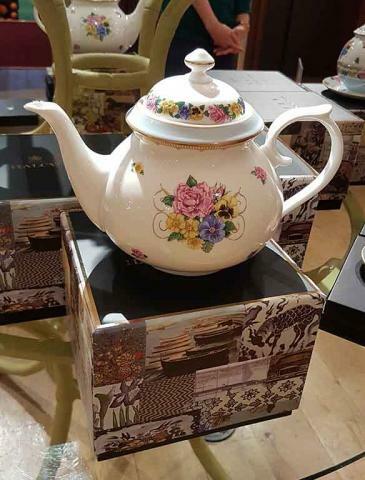 The floral paintwork is delicate and intricate with a soft beauty that can't be replicated by machiene work. These are artisan craftspieces. That are truly Best of British. 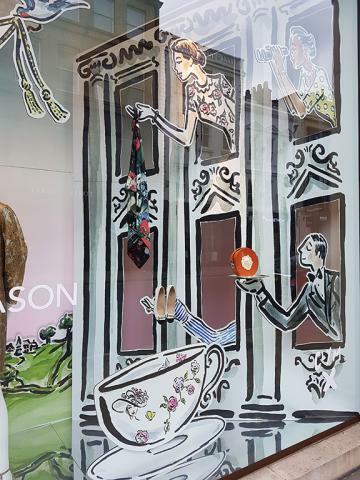 To the left the Pot of Tea for one set cproved to be quite popular with visitors to Fortnums. 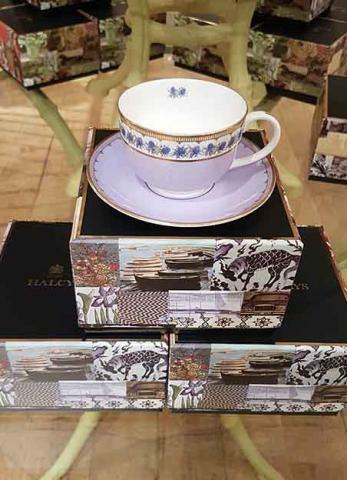 With a tea cup and saucer crafted to form the base of the set it's an ingenious design. I'd personally rather share a cup with a group but it's a beautifully crafted piece to fall in love with. 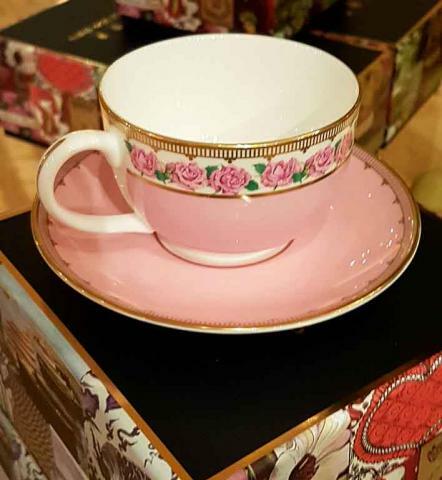 The rituals of tea drinking may be a little less familar to many people today but the beauty and skill of the work in creating the ceramics of the tea set are something that seems so core to the DNA of British life. 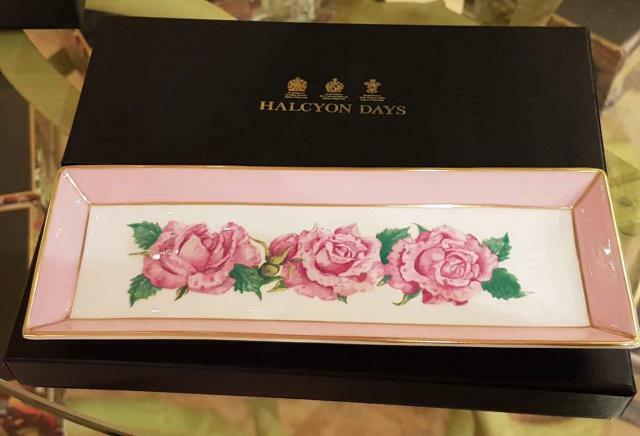 I challenge anyone not to fall in love with the charm of Halcyon Days and think it has a bright future.